Gitmo Clock 2018 photos - Welcome to "Close Guantánamo"
June 15, 2018 marked the 6,000th day of existence for the prison at Guantánamo Bay. 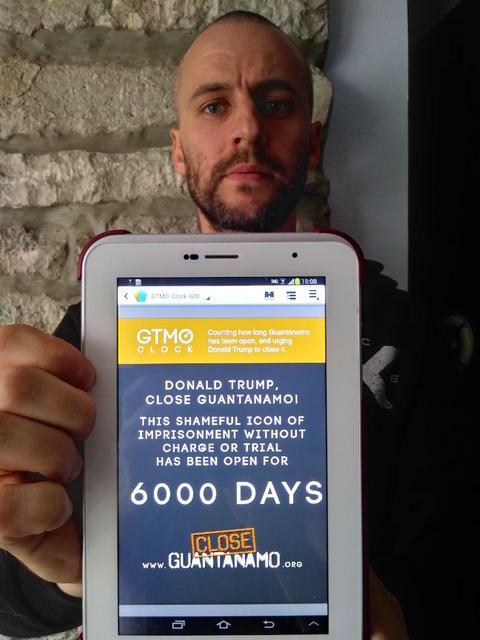 Please join us in our ongoing campaign to mark how many days the prison has been open, via the Gitmo Clock, and to tell Donald Trump to close it. 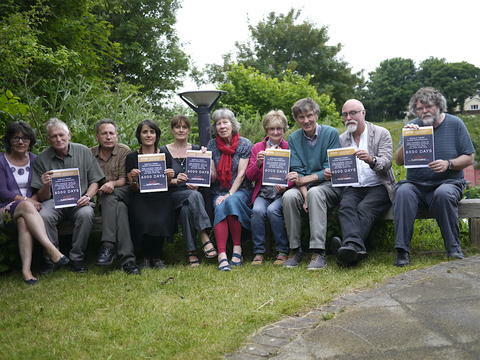 Some of the opponents of Guantánamo who are supporting the new poster campaign for 2018, showing Donald Trump how many days Guantánamo has been open, and urging him to close it once and for all. January 11, 2018 was the 16th anniversary of the opening of the "war on terror" prison at Guantánamo Bay, Cuba, and it marked 5,845 days since the prison opened. 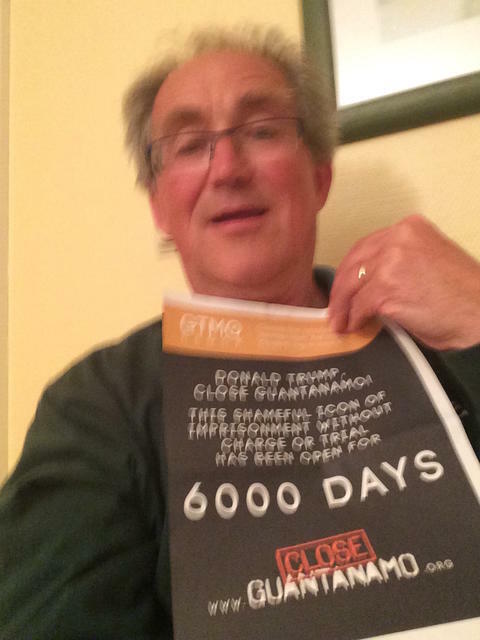 To mark this grim occasion — which ought to be a source of shame for all decent Americans and citizens of the world who respect the rule of law — we have launched a new initiative: inviting opponents of Guantánamo’s continued existence to take a photo of themselves holding a poster telling Donald Trump to close the prison, and marking how long it has been open. The launch article for the initiative is here. Please print off a poster marking how many days the prison has been open via the Gitmo Clock website, which we’ve just revived. 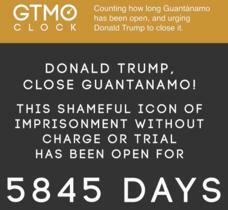 The clock counts, in real time, exactly how many days, hours, minute and seconds Guantánamo has been open, and we've made available posters for every 25 days throughout the year, with the next poster being for 6,025 Days on Jul. 10, then 6,050 Days (Aug. 4), 6,075 Days (Aug. 29), 6,100 Days (Sep. 23), 6,125 Days (Oct. 18), 6,150 Days (Nov. 12), 6,175 Days (Dec. 7) and 6,200 Days (Jan. 1, 2019). Posters for the rest of 2019 are here. Feel free to take as many photos as you want with these posters and send them to us, with, if you wish, a message for Donald Trump, and if you wish, your memories of what you were doing when the prison opened on January 11, 2002. 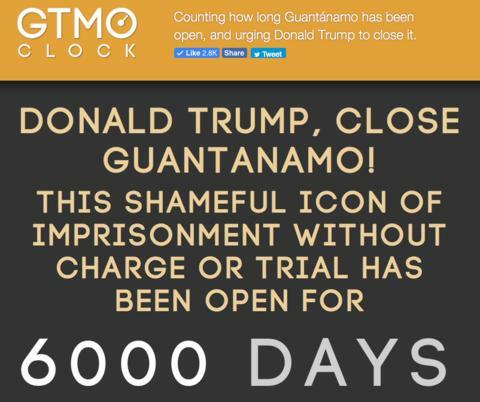 If you want to take a photo at any other time, you can always take a screenshot of the Gitmo Clock page, as is the case with the photos below featuring posters for 5,850, 5,860, 5,865, 5,905 and 5,986 days. Marking 6,000 days of Guantánamo's existence, Shelby Sullivan-Bennis, an indefatigable attorney with Reprieve U.S., who represents prisoners still held at Guantánamo, including Abdellatif Nasser, a Moroccan approved for release by a high-level review process under President Obama, but who is still held, said, "Today marks 6000 days since Guantánamo Bay first opened its gates – 6000 days of torture, abuse, and indefinite detention without charge. It is a cruel reminder of just how long this injustice has gone on." She added, "But this terrible day also coincides with one of great significance for Muslims all around the world, including those detained illegally at Guantánamo – the festival of Eid. Eid marks the end of a month of fasting, and millions of Muslims across the globe will be celebrating with family gatherings, gifts, and feasts. But the remaining men in Guantánamo will be spending Eid thousands of miles from their families. At a time like this, these men can feel alone and abandoned: we want to remind these men that they are not." 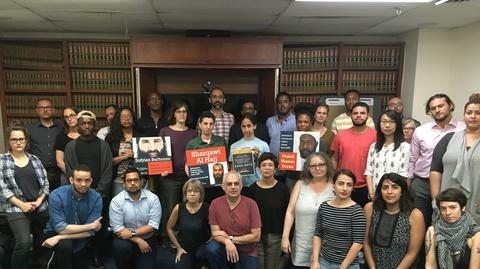 A great photo of the Center for Constitutional Rights’ staff and interns in New York united in calling for the closure of Guantánamo on its 6,000th day of existence on June 15, 2018. 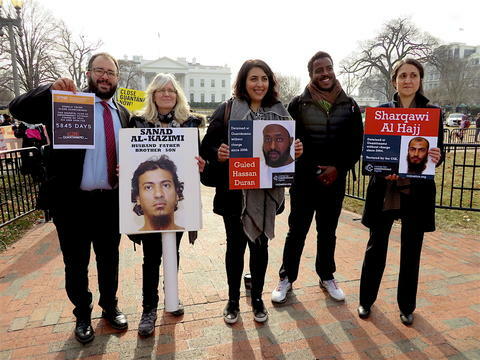 Staff also hold up placards for three prisoners CCR represent: Sufyian Barhoumi, approved for release by a high-level review process under President Obama, but still held, and "forever prisoners" Sharqawi al-Hajj and Guled Hassan Duran. Albert Valencia and Dorrine Marshall at a demonstration in Huntington Beach, CA. 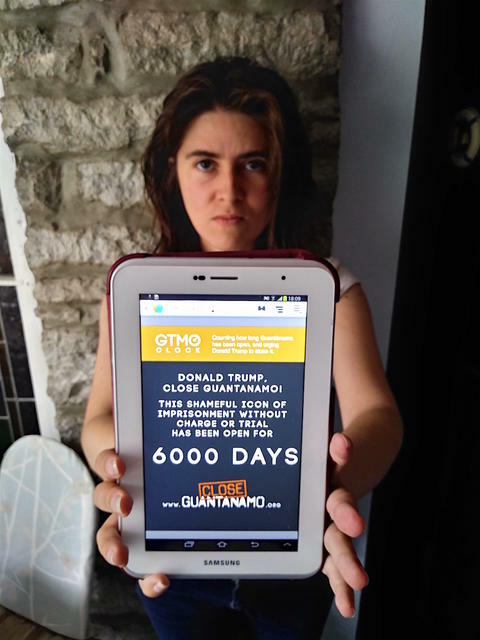 call on Donald Trump to close Guantánamo on its 6,000th day of existence on June 15, 2018. Dr. David Nicholl, a neurologist in Birmingham, in the U.K., and a long-time campaigner against Guantánamo, and for the release of Shaker Aamer, the last British resident held at Guantánamo, says, "I stand with Shaker still," in reference to the We Stand With Shaker campaign that helped secure Shaker's release in October 2015. 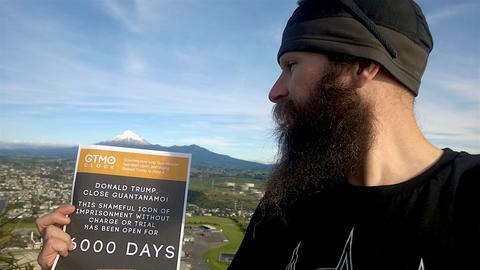 Halldór Heiðar Bjarnason (Iceland) and his partner Lilian Pineda De Avila (Mexico/Iceland) call on Donald Trump to close Guantánamo on its 6,000th day of existence on June 15, 2018. 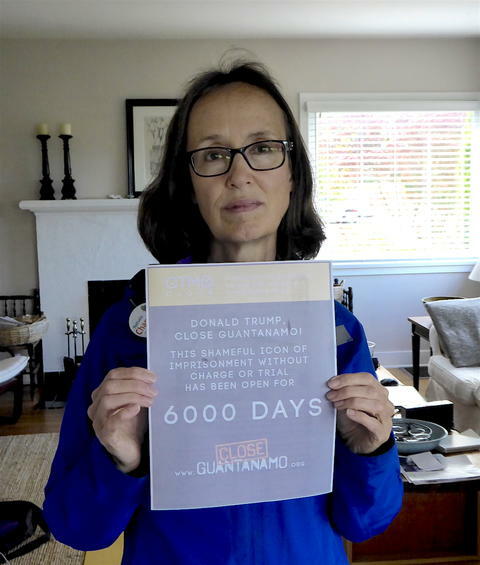 Brian Terrell of Voices for Creative Nonviolence and his wife Betsy Keenan call on Donald Trump to close Guantánamo on its 6,000th day of existence on June 15, 2018. 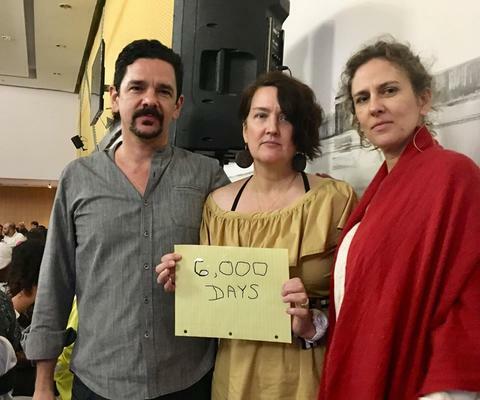 Academics Don Walicek, Diana Murtaugh Coleman and Jessica Adams were in Cuba, at a Caribbean Studies Association meeting in Havana, and made a handmade sign because they couldn't get to a printer. 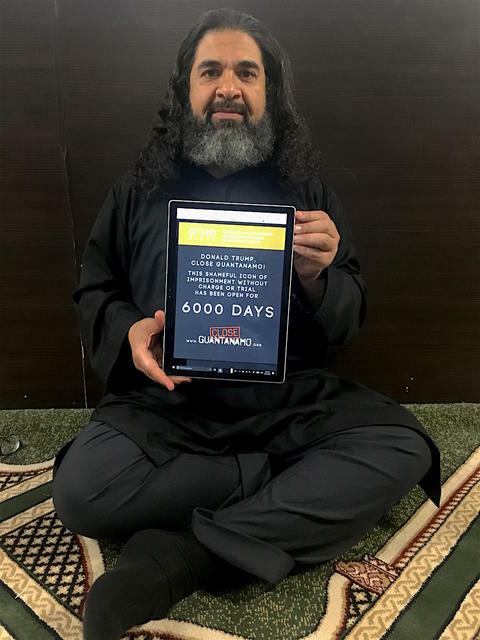 Walicek stated, "Today, June 15th 2018, marks 6,000 days of operation for the U.S. government's extra-legal prison at Guantánamo Bay. The prison should be closed and the various political and legal structures that allow it to exist should be dismantled once and for all." 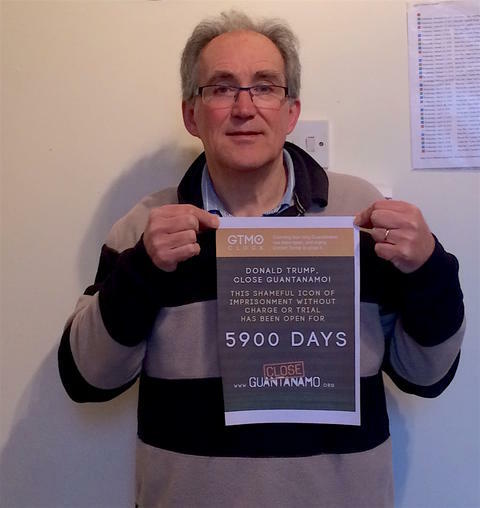 Ed Charles, the editor and webmaster of the World Can't Wait’s Spanish website, calls on Donald Trump to close Guantánamo on the 6,000th day of the prison’s existence. 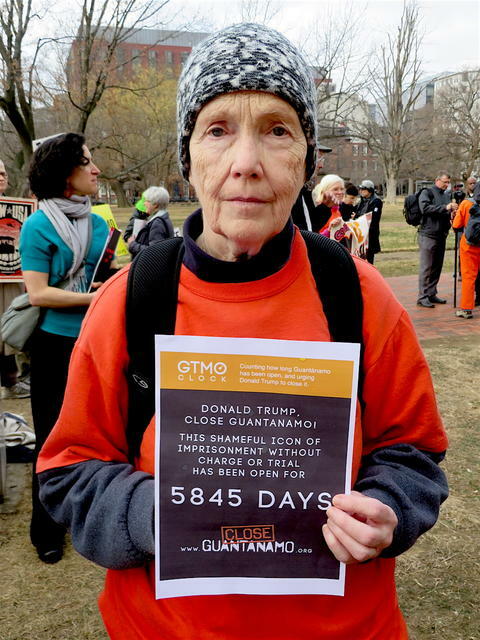 Susan McLucas, from Somerville, Massachusetts, thinks it's "a horror that Guantánamo is still open." She says, "We cannot let the innocent men there spend any more of their lives in prison for no reason, often being tortured. Even the guilty ones, assuming they are guilty, have been horribly mis-treated." 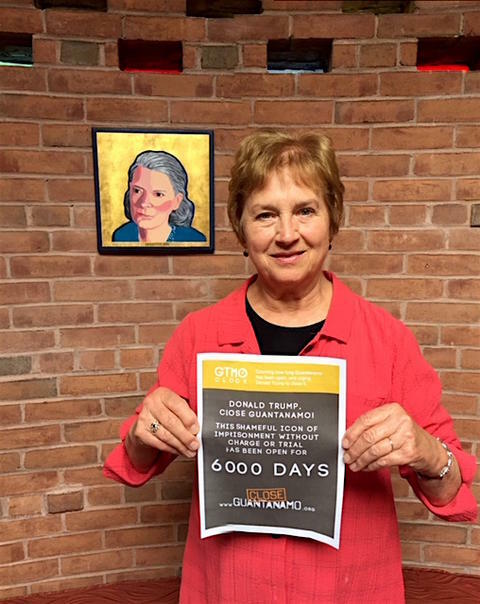 Pat Ferrone in Dedham, Massachusetts calls on Donald Trump to close Guantánamo on the 6,000th day of the prison’s existence. 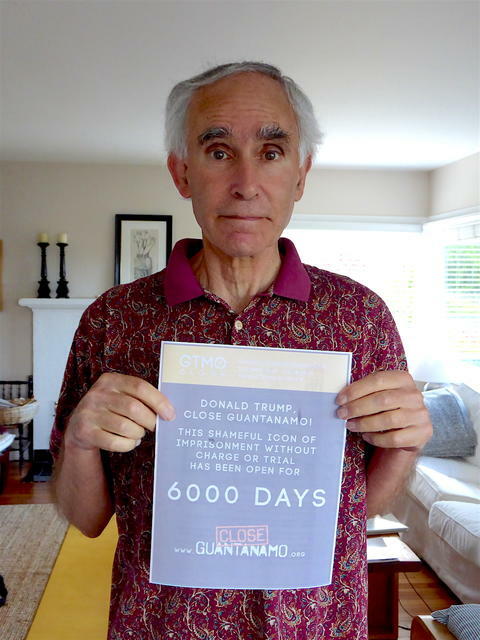 Joe Ferrone in Dedham, Massachusetts calls on Donald Trump to close Guantánamo on the 6,000th day of the prison’s existence. 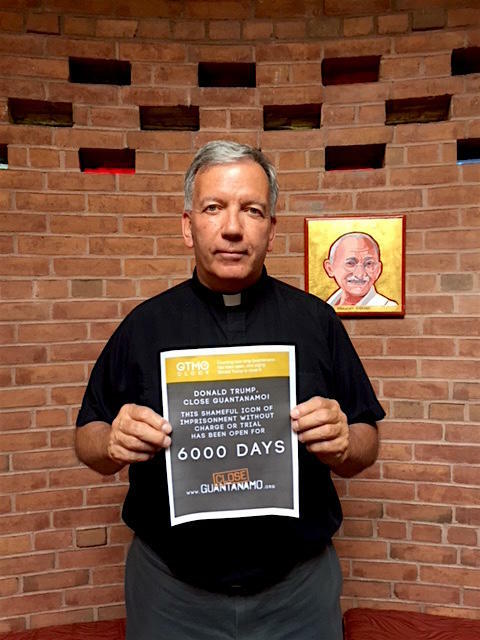 Father Steve Josoma, the pastor of St. Susanna Parish in Dedham, Massachusetts calls on Donald Trump to close Guantánamo on the 6,000th day of the prison’s existence. 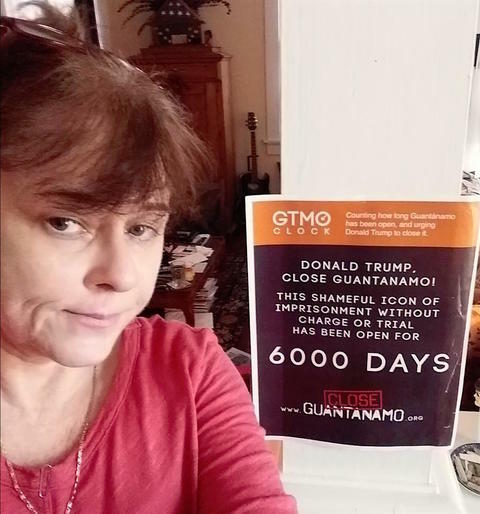 Eileen Gorman in Dedham, Massachusetts calls on Donald Trump to close Guantánamo on the 6,000th day of the prison’s existence. 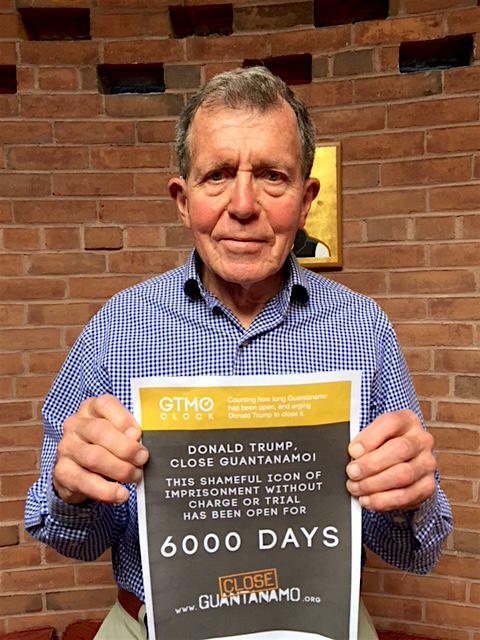 Rowan Chivers calls on Donald Trump to close Guantánamo on the 6,000th day of the prison’s existence. Jess Hope in Wales sent the three photos above, and said, "The group one is Cardigan and North Pembrokeshire Amnesty International Group. Then there is Claire Sandham, and the two ladies are Sheila and Jen Thomas. We are all heartbroken that Guantánamo is still open and that Trump is ignoring the terrible injustice these men have suffered. We're appalled that conditions in Guantánamo are deteriorating, that the artwork of prisoners has been appropriated and that the government have threatened to burn it. These are all signs of weakness, not greatness on the American Government’s part. Thank you for your tireless effort to bring justice and for shining a light in this dark place." 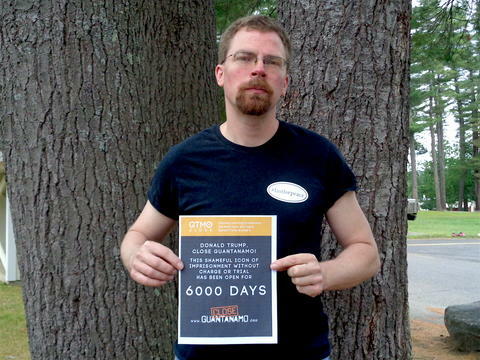 Close Guantánamo co-founder Andy Worthington says, "6,000 days is far longer than the two world wars combined. It is outrageous that the U.S. government continues to perpetuate the myth of an 'endless war,' as a supposed justification for holding prisoners indefinitely without charge or trial, when this is, in fact, a policy for which there is no justification whatsoever." 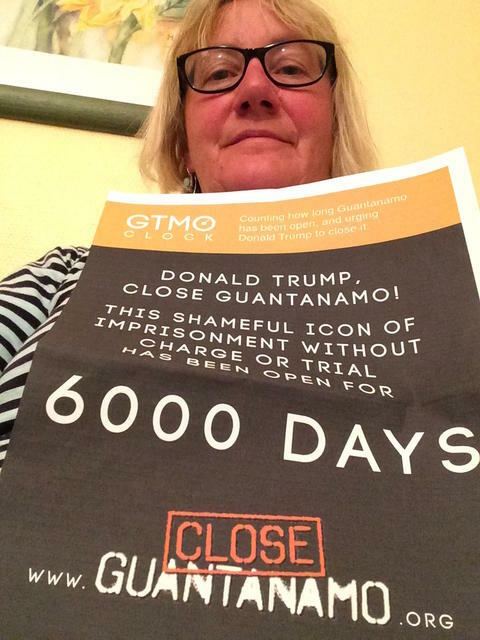 Dot Young, in London, calls on Donald Trump to close Guantánamo on the 6,000th day of the prison’s existence. 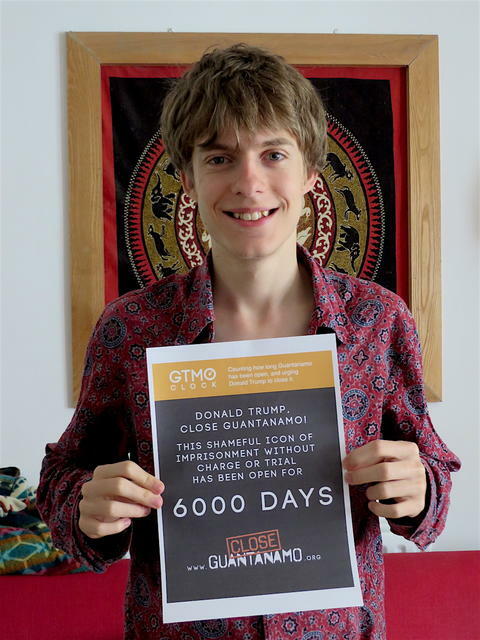 Tyler Worthington, in London, calls on Donald Trump to close Guantánamo on the 6,000th day of the prison’s existence. Brian Winters in Concord, New Hampshire says, "Last week, Donald Trump pardoned Alice Johnson, recognizing that just because someone could be kept behind bars, justice does not always require keeping them there. This week, Donald Trump demonstrated he was capable of moving past his 'fire and fury' rhetoric and deescalating a volatile situation with North Korea. 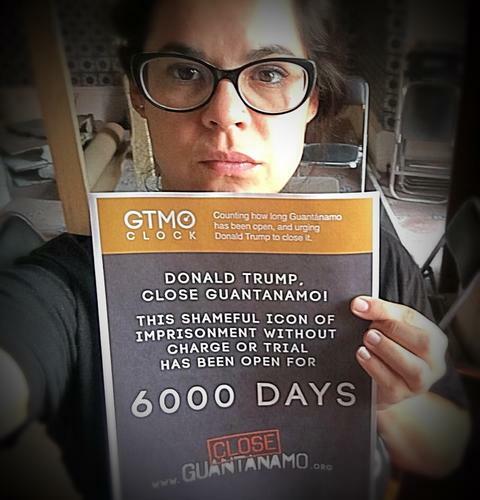 Next week, Donald Trump, please close Guantánamo!" 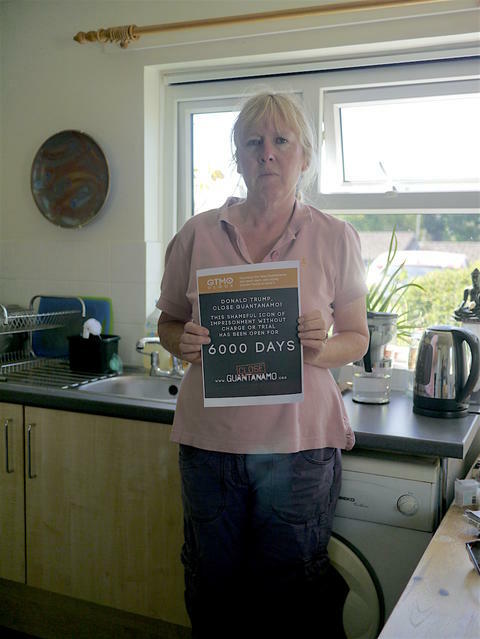 Responding to the number of days the Guantánamo prisoners have had to endure the prison's existence, British activist Susie Sullivan says, "Not to mention unbearable nights! Plus the constant terror of what will be done next!?!?" 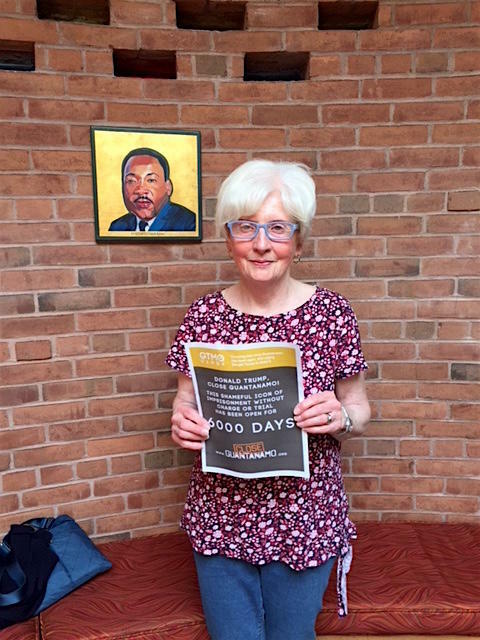 To mark 6,000 days of Guantánamo's existence, British activist Bernie Sullivan says, "Well done for keeping up the fight." 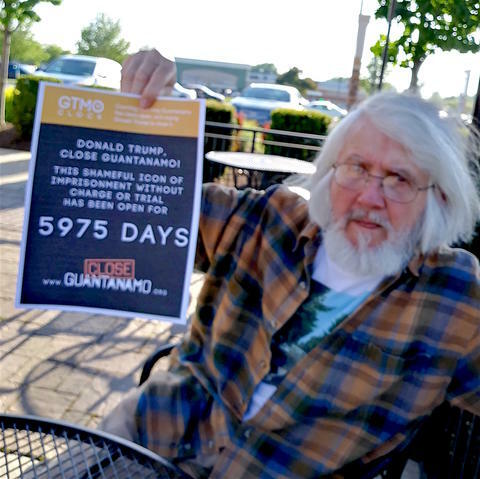 In Bethesda, Maryland, long-time Close Guantánamo supporter Steve Lane says, "Dear President Trump, you have the historic opportunity to correct the glaring errors your predecessors in office made when they imprisoned men at Guantánamo Bay for years without charge or trial. Make America great again, in our eyes and the eyes of the world, by bringing them justice!" 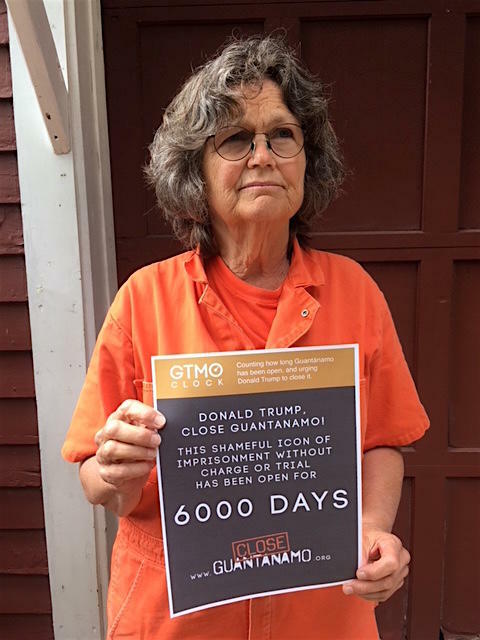 On June 15, 2018, marking 6,000 days of Guantánamo's existence, Lorraine Barlett, former military defense attorney for Ghassan al-Sharbi, who is still held at Guantánamo without charge or trial, calls on Donald Trump to close the prison without further delay. 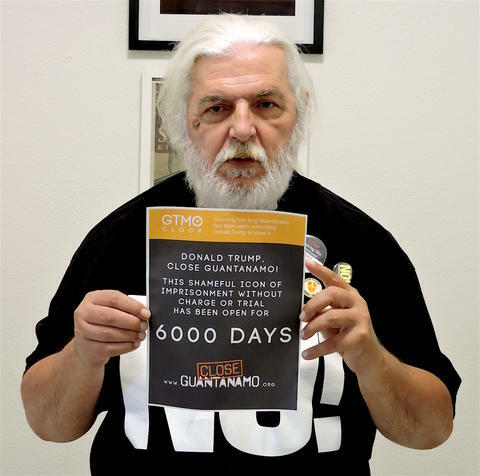 On June 15, 2018, marking 6,000 days of Guantánamo's existence, Sanchez Montebello, a musician and DJ from Long Beach, California, says, "If Trump can make peace with North Korea, then he can close Guantánamo as well. Keep fighting the good fight." 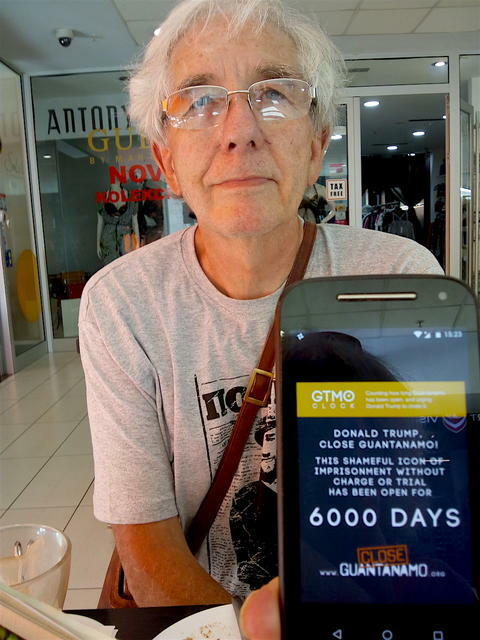 On June 15, 2018, marking 6,000 days of Guantánamo's existence, Natalia Rivera Scott in Mexico City calls on Donald Trump to close the prison without further delay. 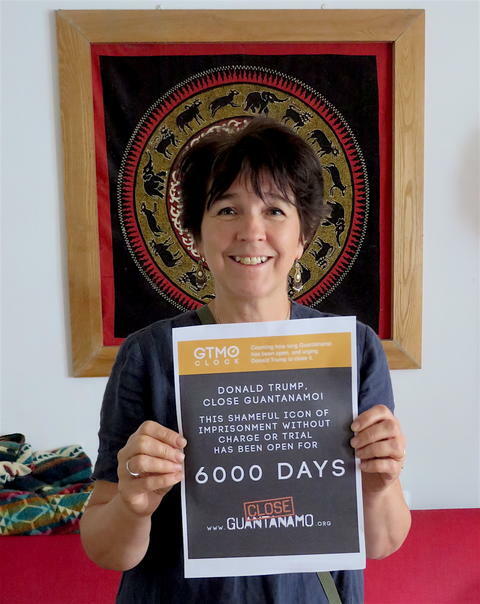 Carolyn Burch in the U.K. urges Donald Trump to close Guantánamo on the 6,000th day of its existence. Richard Raggett in the U.K. says, "Please add my support to the campaign." 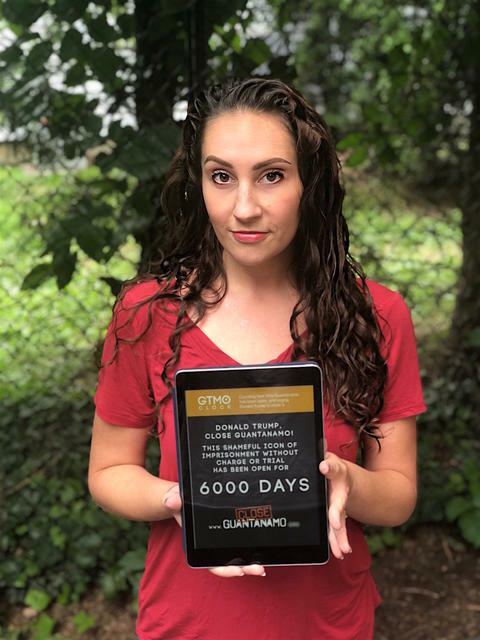 On June 1, 2018, Jenny Jones was photographed marking 5,986 days of Guantánamo's existence. 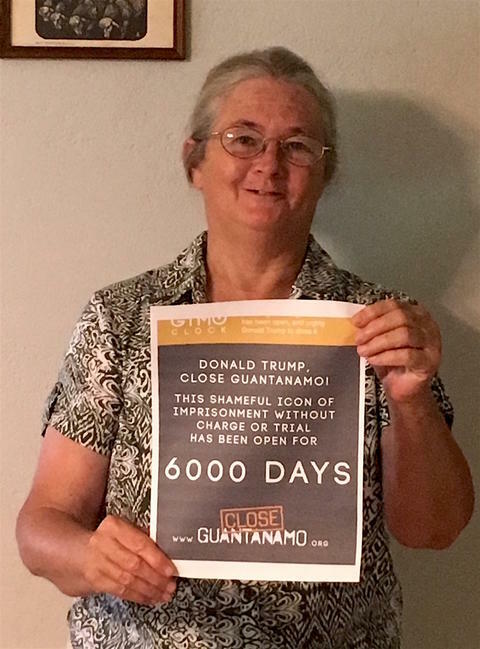 Mary, in the U.S., photographed by Martin Gugino, marking 5,975 days of the existence of the prison at Guantánamo Bay, on May 21, 2018, and calling for Donald Trump to close it without further delay. 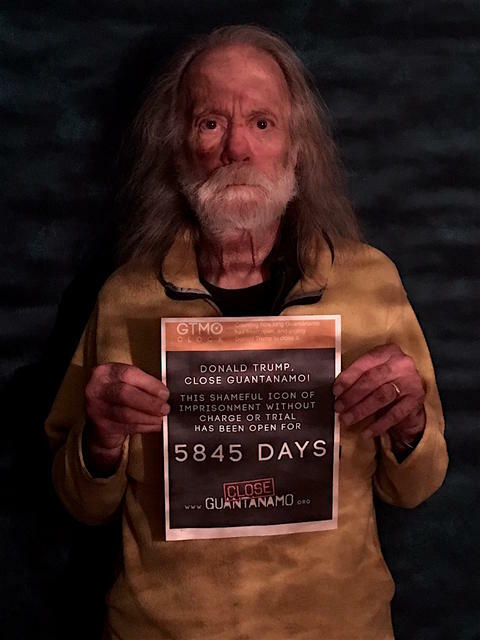 Terry, in the U.S., photographed by Martin Gugino, marking 5,975 days of the existence of the prison at Guantánamo Bay, on May 21, 2018, and calling for Donald Trump to close it without further delay. 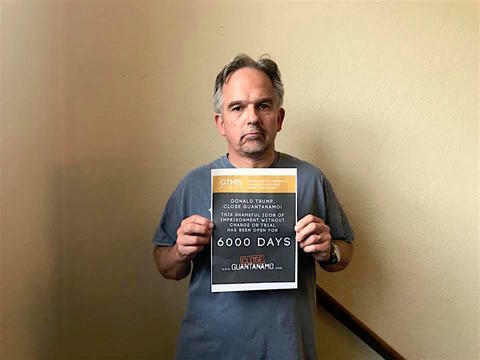 To mark 5,975 days of Guantánamo, on May 21, 2018, our co-founder Andy Worthington, photographed here, stated, "5,975 days ago, the U.S. government, under George W. Bush, opened a prison at Guantánamo Bay, Cuba that was profoundly shameful then and is no less shameful now. It was designed to be beyond the reach of the law, where prisoners seized in the 'war on terror' declared after the terrorist attacks on September 11, 2001 could be held indefinitely, and interrogated with any restraint on the behavior of those seeking information from them. This would have been unacceptable even if those seized were 'the worst of the worst,' as the Bush administration claimed they were, but most were no such thing. Only around 3% of the nearly 800 men held by the military at Guantánamo since January 2002 can be objectively regarded as having had any meaningful connection to al-Qaeda or other international terrorist groups. Most were either soldiers, inappropriately labeled as terrorists post-9/11, or people simply in the wrong place at the wrong time, mostly sold to the U.S. for bounty payments by their allies in Afghanistan and Pakistan. All had all their fundamental rights as human beings stripped away from them, and are still fundamentally without rights, only ever able to be freed at the whim of the president of the United States, and as we know, the current president hates Muslims and wants to keep Guantánamo open forever." Andy added, "5,975 days since Guantánamo opened, 40 men still remain in the prison. Please help us call for them to be either charged or released, and for Guantánamo to be closed once and for all." 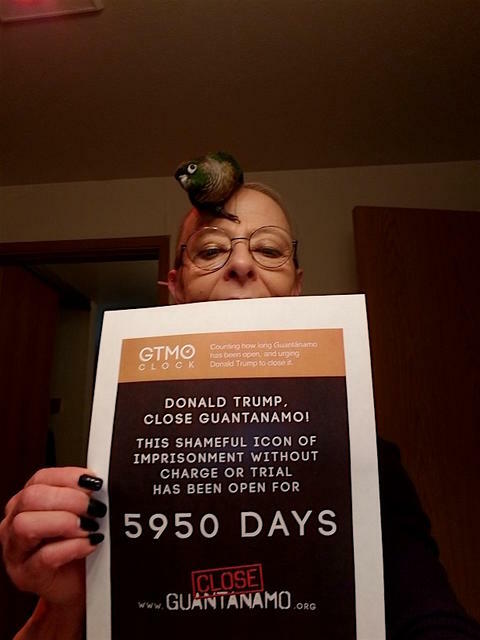 Jan Strain in Seattle — and her bird — marking 5,950 days of Guantánamo’s existence. Jan also sent the following message: "To Donnie - Grow a soul and SHUT IT DOWN! There is no reason to keep GTMO open except cruelty and inhumanity." 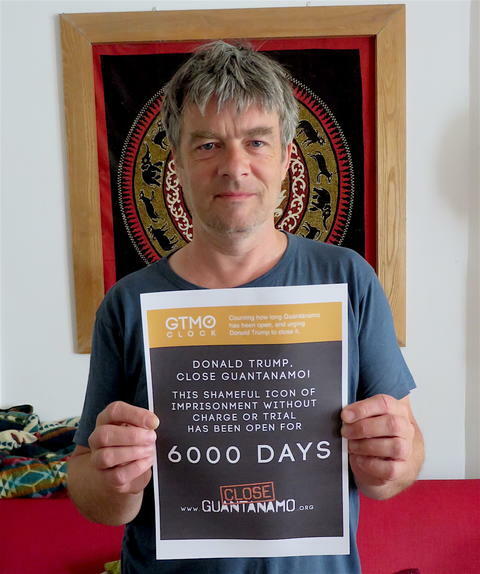 Please join us for the big milestone on June 15, when Guantanamo will have been open for 6,000 days. The poster is here. 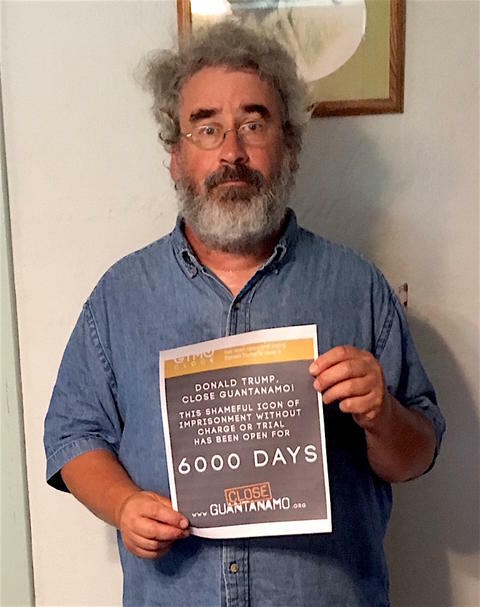 Today, April 26, 2018, the prison at Guantánamo Bay has been open for 5,950 days, and Steve Lane in Bethesda, Maryland has the following message for Donald Trump: "The men imprisoned at Guantánamo Bay are human beings like you and me, President Trump. Why don't they have the same right to know the charges against them, and to answer those charges, that you and I have?" Please join us for the big milestone on June 15, when Guantánamo will have been open for 6,000 days. The poster is here. 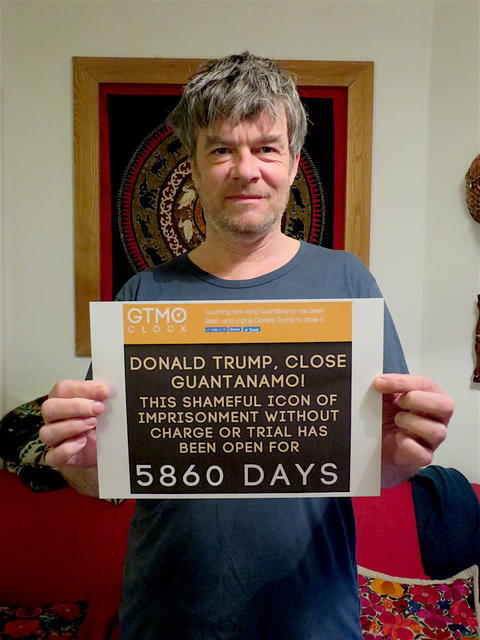 On March 12, Close Guantánamo co-founder Andy Worthington called on Donald Trump to close the prison, 5,905 days since it opened. He says, "In June, this monstrous place will have been open for 6,000 days. How is it acceptable for a country that claims to respect the rule of law to be holding people for so long without charge or trial, when this is actually something that only dictatorships do?" 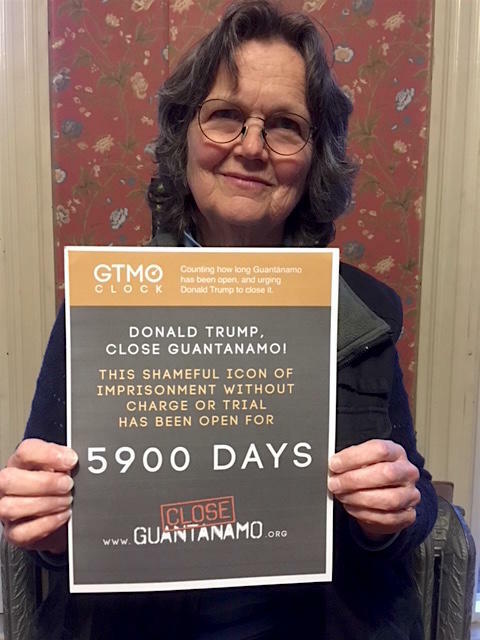 As Guantánamo marked its 5,900th day of operations, in Boston, Massachusetts, Susan McLucas, a U.S. activist and teacher, and Josefine Alde, a German teaching student, joined Close Guantánamo's call for Donald Trump to close the prison once and for all, and to bring to an end the stain on America's reputation, as a country that respects the rule of law, that is caused by maintaining an offshore gulag where men are held indefinitely without charge or trial. For March 7, Carolyn Burch sent these two photos — of herself and her husband Richard Raggett, in St. Andrews, in Fife, Scotland — for our ongoing photo campaign, urging Donald Trump to close the prison at Guantánamo Bay. 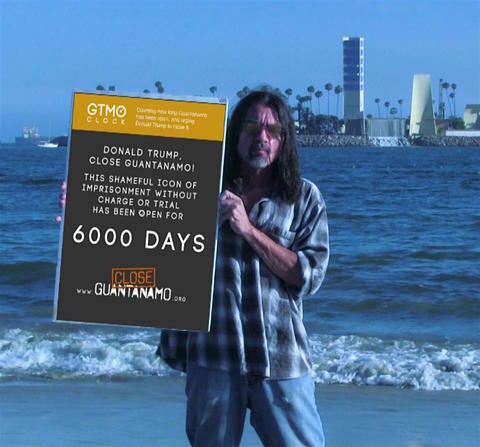 Today, Guantánamo has, disgracefully, been open for 5,900 days — 5,900 days in which the majority of the men held have been imprisoned without charge or trial, in clear defiance of all laws and treaties agreed by nations that regard themselves as civilised, who all insist that no one can be deprived of their liberty unless they are convicted of a crime in a recognized court of law, or are held as prisoners of war under the Geneva Conventions, which protect them from torture and other forms of abuse. And yet, under the third president to be in charge of Guantánamo, the detention conditions for the 41 men who are still held at Guantánamo still do not conform to internationally recognized standards. 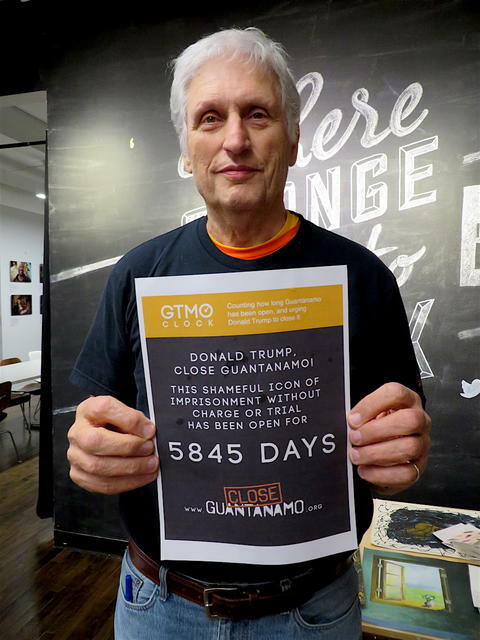 February 10 marked the 5,875th day of operations at the prison at Guantánamo Bay, where 41 men are still held, predominantly without charge or trial, and Ken Jones from North Carolina joined our call for Donald Trump to close Guantánamo for good. Ken was in Washington, D.C. with Witness Against Torture for the anniversary of the opening of Guantánamo on January 11, and was one of five activists, representing the five prisoners approved for release under President Obama who are still held, to be "arrested by the Secret Service after they crossed a police line, and were then handed over to the DC police," as Mike Fiala wrote for WAT, adding, "It now appears that even walking on to Pennsylvania Avenue which runs in front of the White House and across from Lafayette Park, can get you arrested. Yellow police tape is ready to be rolled out frequently around Pennsylvania Avenue." 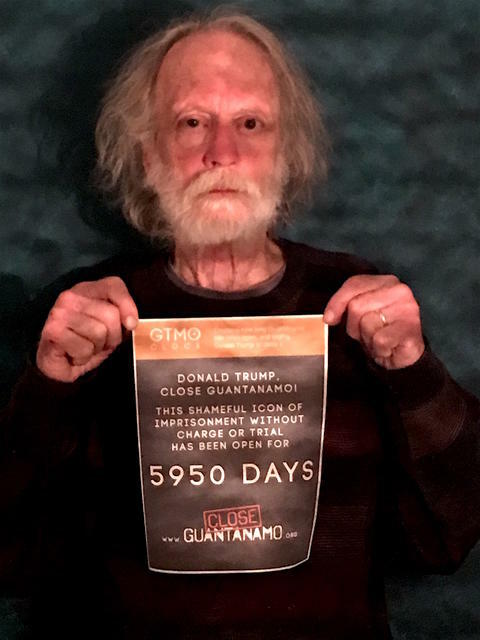 Today, February 10, the prison at Guantánamo Bay has been open 5,875 days, and Steve Lane in Bethesda, Maryland has the following message for Donald Trump: "President Trump, you promised to make America great again. Keeping Guantánamo Bay prison open does just the opposite — it goes against everything that ever made us special." 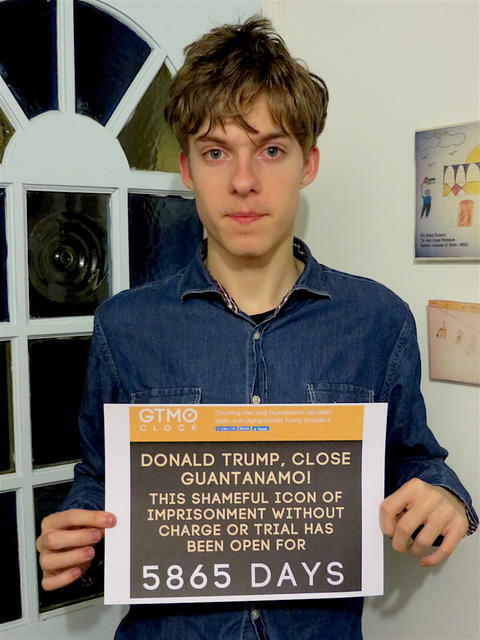 Reacting to the news that Donald Trump has issued an executive order officially keeping Guantánamo open, as the prison marks the 5,865th day of its operations, Tyler Worthington​, the son of Close Guantánamo co-founder Andy Worthington​, calls for its closure. Tyler was only two years old when Guantánamo opened, and now he's 18, providing a vivid demonstration of quite how long the prison has been open. 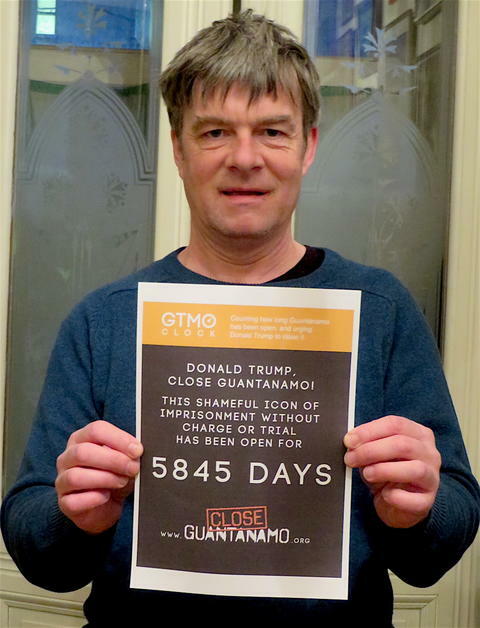 On January 26, Close Guantánamo co-founder Andy Worthington pointed out that it was 5,860 days since the prison opened, ironically on the same day that information was leaked suggesting that Donald Trump is about to issue an executive order formally approving the prison's continued existence, a shameful intention that Andy wrote about here. Please join us in showing your opposition to this disgraceful plan! 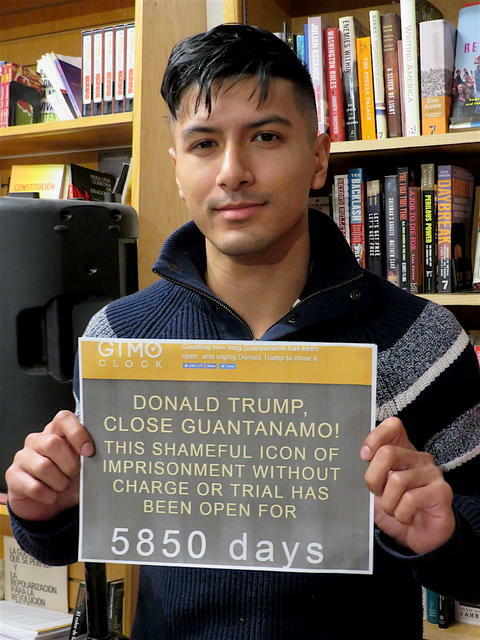 Close Guantánamo supporter Arthur Sayed calls on Donald Trump to close the prison at Guantánamo Bay at Close Guantánamo co-founder Andy Worthington’s talk about Guantánamo, torture, Donald Trump and his 12 years of activism at Revolution Books in Harlem on January 16, 2018. He was supporting the new Close Guantánamo initiative, counting how many days Guantánamo has been open — shockingly, 5,850 days on the day of Andy’s talk. 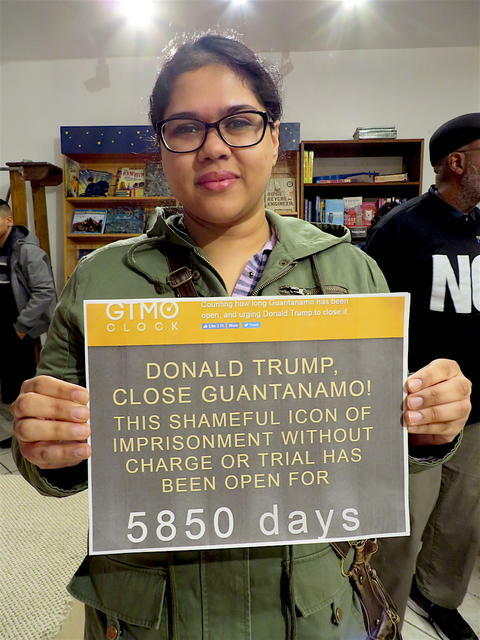 Close Guantánamo supporter Shahela Begum calls on Donald Trump to close the prison at Guantánamo Bay at Close Guantánamo co-founder Andy Worthington’s talk about Guantánamo, torture, Donald Trump and his 12 years of activism at Revolution Books in Harlem on January 16, 2018. She was supporting the new Close Guantánamo initiative, counting how many days Guantánamo has been open — shockingly, 5,850 days on the day of Andy’s talk. 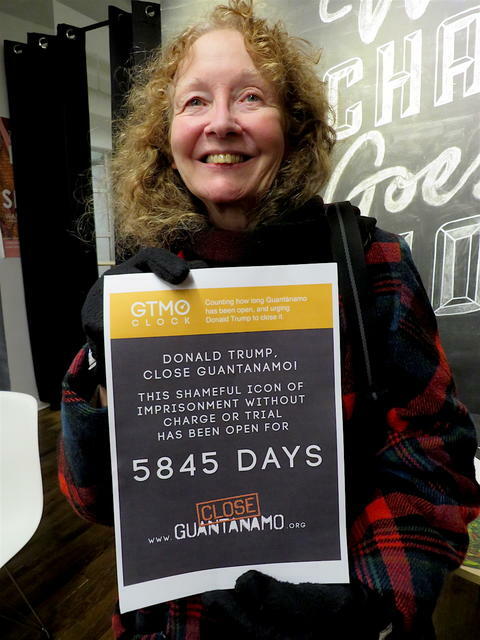 Close Guantánamo supporter Nancy Vining Van Ness calls on Donald Trump to close the prison at Guantánamo Bay at Close Guantánamo co-founder Andy Worthington’s talk about Guantánamo, torture, Donald Trump and his 12 years of activism at Revolution Books in Harlem on January 16, 2018. 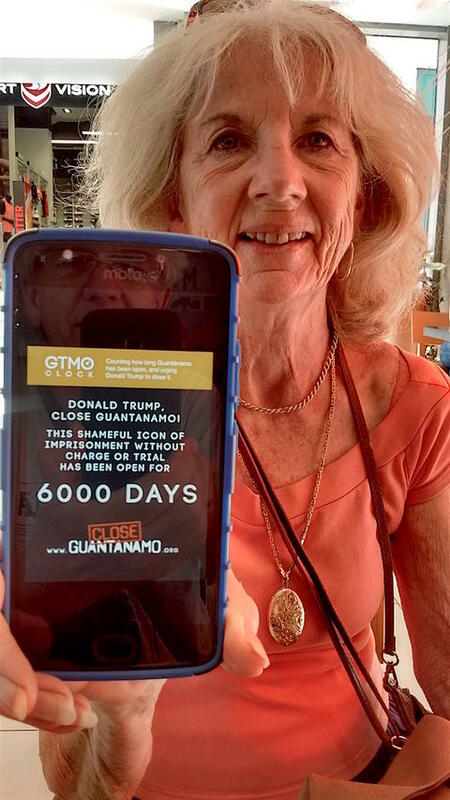 She was supporting the new Close Guantánamo initiative, counting how many days Guantánamo has been open — shockingly, 5,850 days on the day of Andy’s talk. Former Guantánamo military defense attorney Maj. Todd Pierce (retd.) 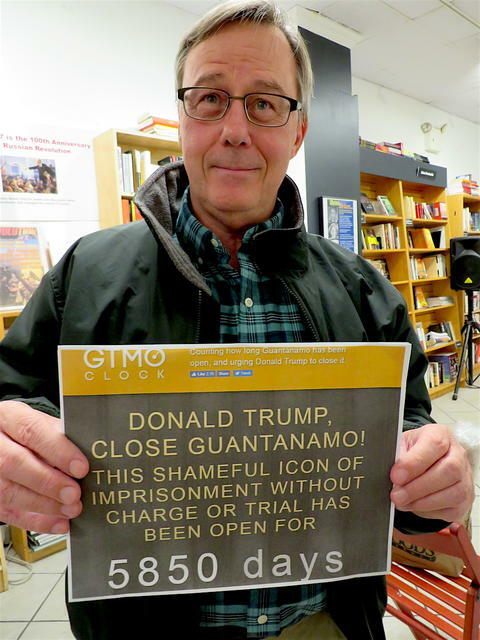 calls on Donald Trump to close the prison at Guantánamo Bay at Close Guantánamo co-founder Andy Worthington’s talk about Guantánamo, torture, Donald Trump and his 12 years of activism at Revolution Books in Harlem on January 16, 2018. He was supporting the new Close Guantánamo initiative, counting how many days Guantánamo has been open — shockingly, 5,850 days on the day of Andy’s talk. A couple at Close Guantánamo co-founder Andy Worthington’s talk about Guantánamo, torture, Donald Trump and his 12 years of activism at Revolution Books in Harlem on January 16, 2018 tell Donald Trump to close the prison via the new Close Guantánamo campaign, which counts how many days Guantánamo has been open — shockingly, 5,850 days on the day of Andy’s talk. 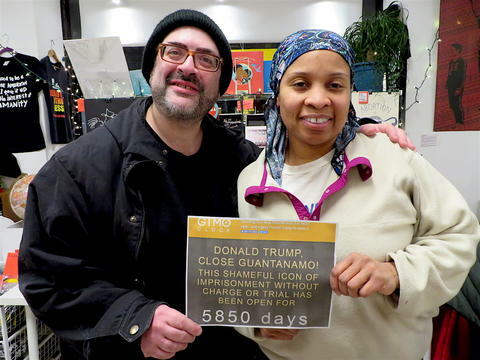 A volunteer at Revolution Books in Harlem tells Donald Trump to close the prison at Guantánamo Bay via the new Close Guantánamo campaign, which counts how many days Guantánamo has been open — shockingly, 5,850 days on January 16, 2018, the day of Close Guantánamo co-founder Andy Worthington’s talk about Guantánamo, torture, Donald Trump and his 12 years of activism at tell Donald Trump to close the prison, when this photo was taken. 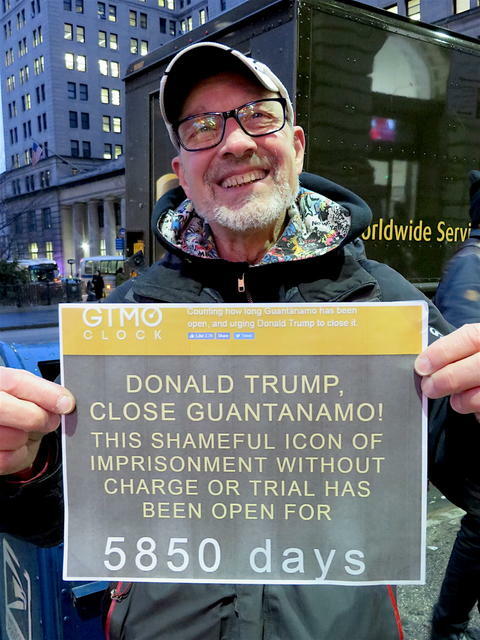 Bob Parsons of RefuseFascism.org, who Close Guantánamo co-founder Andy Worthington met by chance on the street in Brooklyn on Jan. 17, 2018, tells Donald Trump to close the prison via the new Close Guantánamo initiative, which counts how many days Guantánamo has been open. 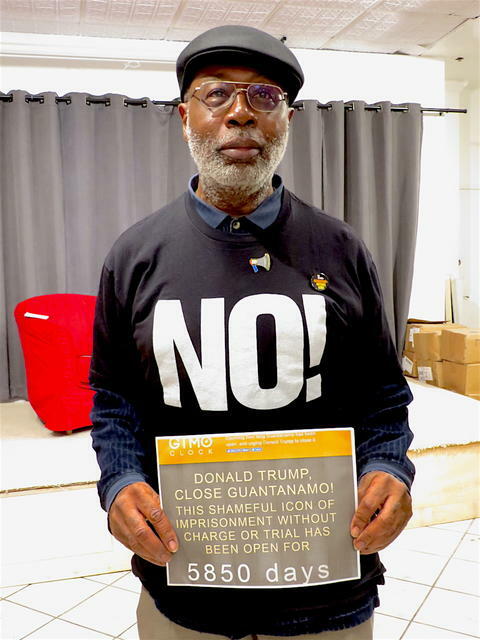 Carl Dix of RefuseFascism.org calls on Donald Trump to close Guantánamo at Close Guantánamo co-founder Andy Worthington’s talk about Guantánamo, torture, Donald Trump and his 12 years of activism at Revolution Books in Harlem on January 16, 2018. He was supporting the new Close Guantánamo initiative, counting how many days Guantánamo has been open — shockingly, 5,850 days on the day of Andy’s talk. 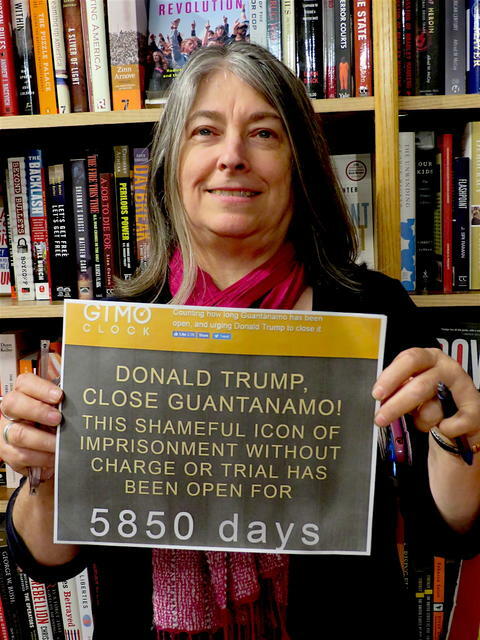 Debra Sweet of RefuseFascism.org and the World Can't Wait calls on Donald Trump to close Guantánamo at Close Guantánamo co-founder Andy Worthington’s talk about Guantánamo, torture, Donald Trump and his 12 years of activism at Revolution Books in Harlem on January 16, 2018. She was supporting the new Close Guantánamo initiative, counting how many days Guantánamo has been open — shockingly, 5,850 days on the day of Andy’s talk. Patrice of Revolution Books calls on Donald Trump to close Guantánamo at Close Guantánamo co-founder Andy Worthington’s talk about Guantánamo, torture, Donald Trump and his 12 years of activism at Revolution Books in Harlem on January 16, 2018. She was supporting the new Close Guantánamo initiative, counting how many days Guantánamo has been open — shockingly, 5,850 days on the day of Andy’s talk. Luke Nephew of the Bronx-based Peace Poets calls on Donald Trump to close Guantánamo at the annual rally outside the White House on January 11, 2018, the 16th anniversary of the opening of the prison. 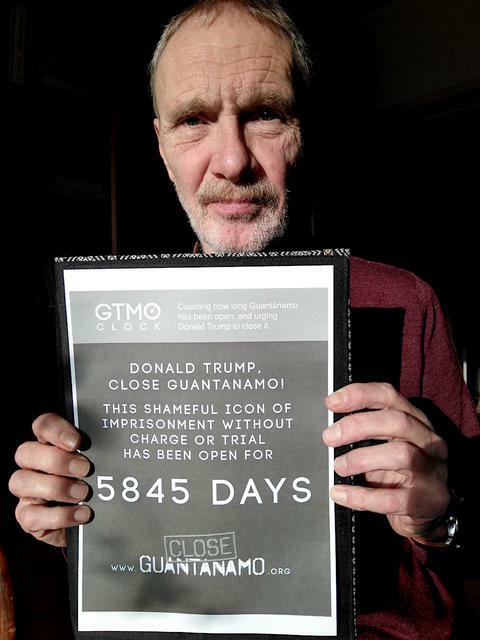 He was supporting the new Close Guantánamo initiative, counting how many days Guantánamo has been open — a shocking total of 5,845 days on the anniversary. The Peace Poets' work is at the heart of the annual protest outside the White House, and Luke's piece, "There Is A Man Under That Hood," is featured in a new book, illustrated with photos by Witness Against Torture's media director, Justin Norman. Details about the book can be found here, and see here for a video of Luke performing the piece at the Guantánamo protest in January 2015. 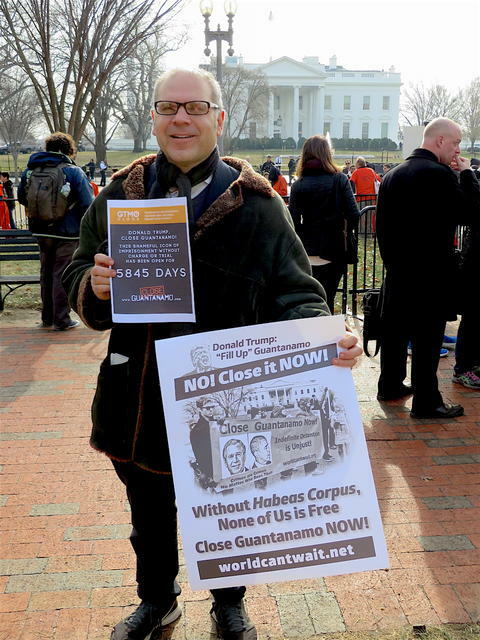 Frank Antonio López of the Bronx-based Peace Poets calls on Donald Trump to close Guantánamo at the annual rally outside the White House on January 11, 2018, the 16th anniversary of the opening of the prison. 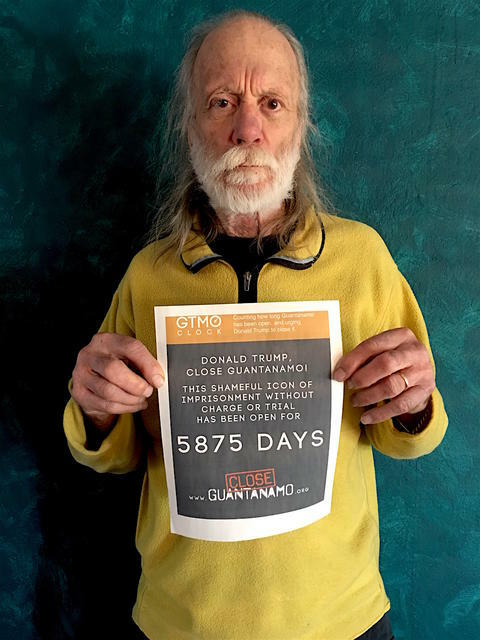 He was supporting the new Close Guantánamo initiative, counting how many days Guantánamo has been open — a shocking total of 5,845 days on the anniversary. The Peace Poets' work is at the heart of the annual protest outside the White House. See here for Frank performing "Everything Is Possible." 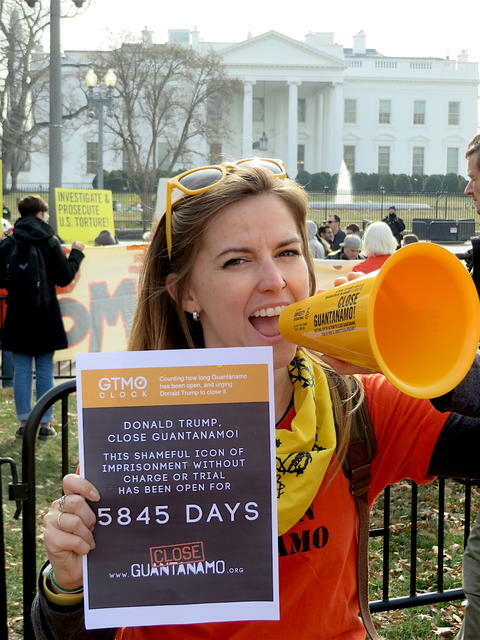 Actress Caroline Lagerfelt calls on Donald Trump to close Guantánamo at the annual rally outside the White House on January 11, 2018, the 16th anniversary of the opening of the prison. 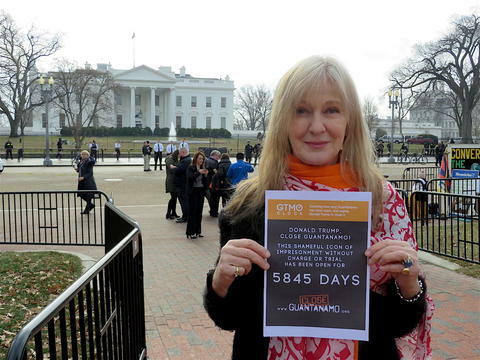 She was supporting the new Close Guantánamo initiative, counting how many days Guantánamo has been open — a shocking total of 5,845 days on the anniversary. 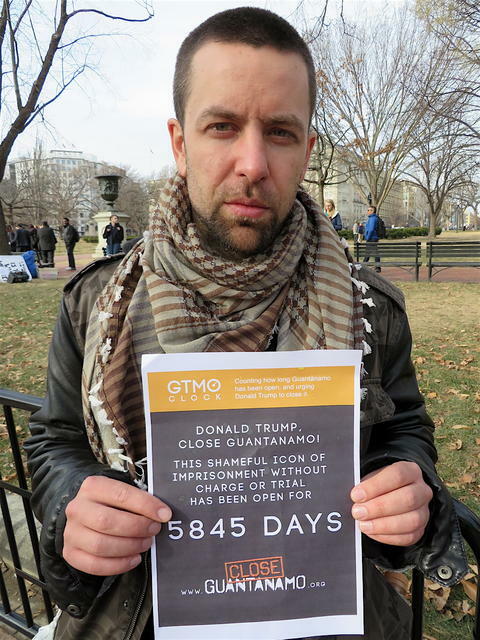 Justin Norman, Witness Against Torture's media director, and the designer of the Gitmo Clock, calls on Donald Trump to close Guantánamo at the annual rally outside the White House on January 11, 2018, the 16th anniversary of the opening of the prison. 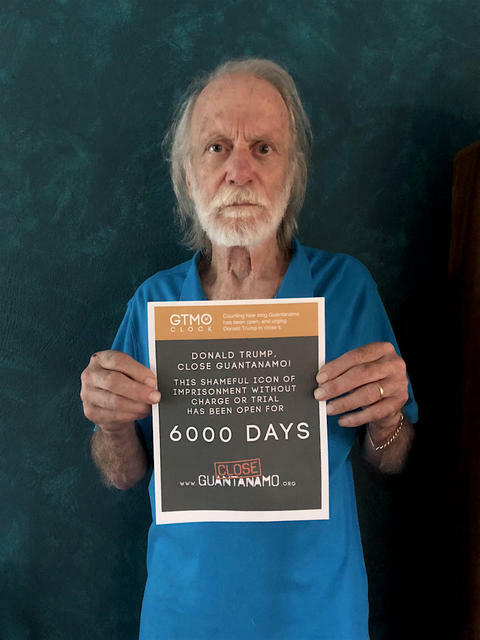 He was supporting the new Close Guantánamo initiative, counting how many days Guantánamo has been open — a shocking total of 5,845 days on the anniversary. Justin's photos feature in a new book, "There Is A Man Under That Hood," illustrating the powerful spoken word piece of the same name by Luke Nephew of the Bronx-based Peace Poets, whose work is at the heart of the annual protest outside the White House. Details about the book can be found here, and see here for a video of Luke performing the piece at the Guantánamo protest in January 2015. 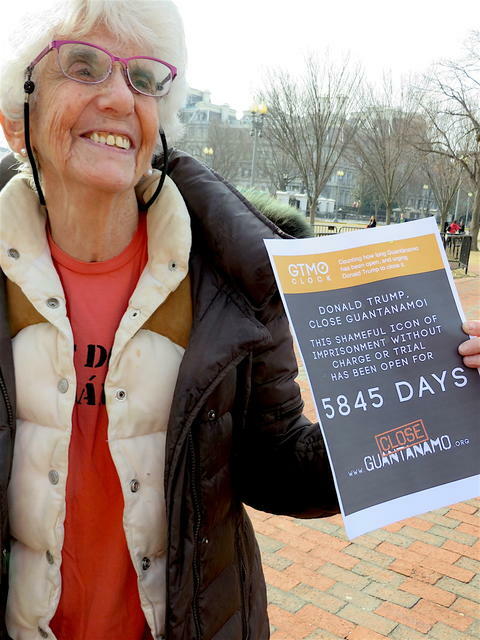 86-year old peace campaigner Eve Tetaz calls on Donald Trump to close Guantánamo at the annual rally outside the White House on January 11, 2018, the 16th anniversary of the opening of the prison. 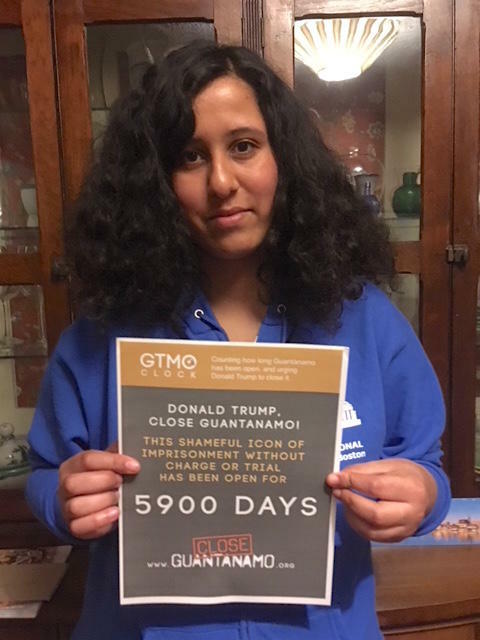 She was supporting the new Close Guantánamo initiative, counting how many days Guantánamo has been open — a shocking total of 5,845 days on the anniversary. Freeman, a campaigner with Witness Against Torture, calls on Donald Trump to close Guantánamo at the annual rally outside the White House on January 11, 2018, the 16th anniversary of the opening of the prison. 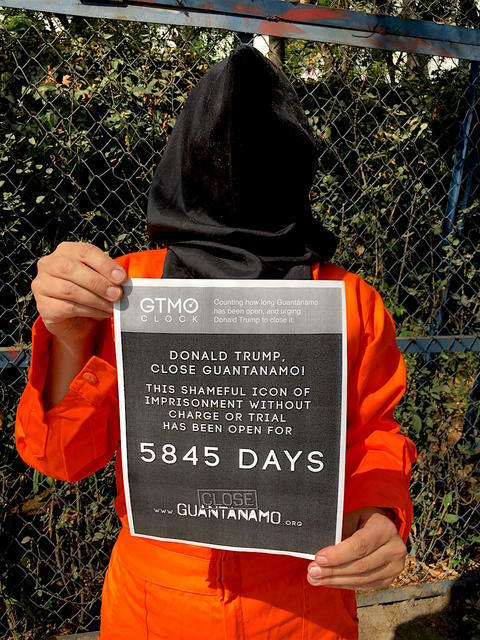 He was supporting the new Close Guantánamo initiative, counting how many days Guantánamo has been open — a shocking total of 5,845 days on the anniversary. 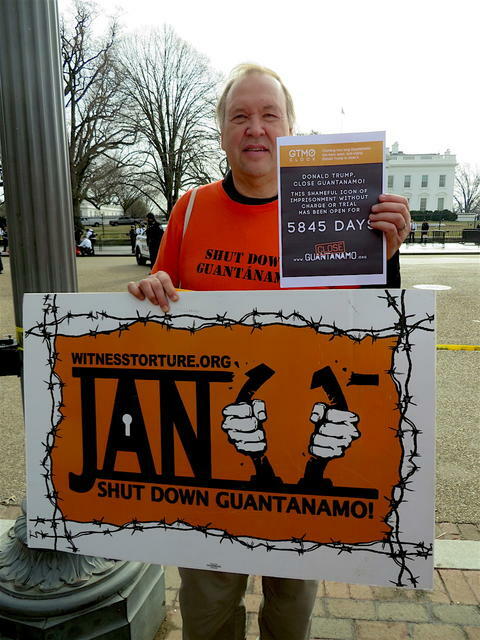 Art Laffin, a peace campaigner with Witness Against Torture, calls on Donald Trump to close Guantánamo at the annual rally outside the White House on January 11, 2018, the 16th anniversary of the opening of the prison. 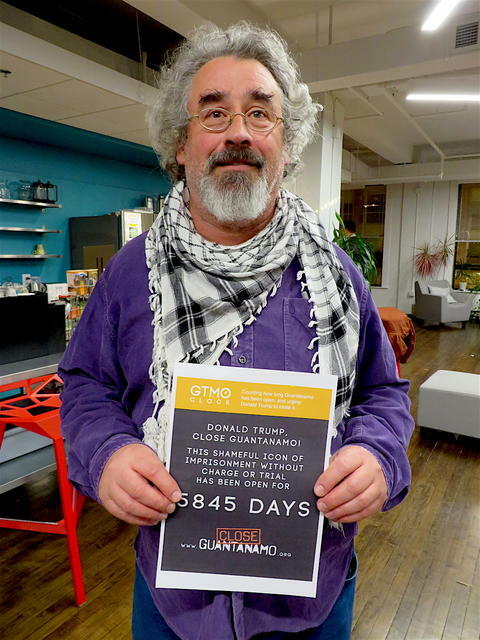 He was supporting the new Close Guantánamo initiative, counting how many days Guantánamo has been open — a shocking total of 5,845 days on the anniversary. Terry Greene of September 11th Families for Peaceful Tomorrows calls on Donald Trump to close Guantánamo at an Interfaith Rally to Close Guantánamo in Cambridge, Massachusetts. 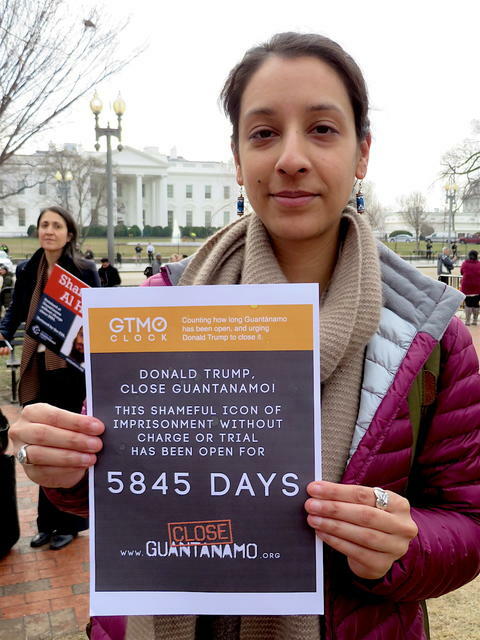 Freelance journalist and researcher Shilpa Jindia calls on Donald Trump to close Guantánamo at the annual rally outside the White House on January 11, 2018, the 16th anniversary of the opening of the prison. 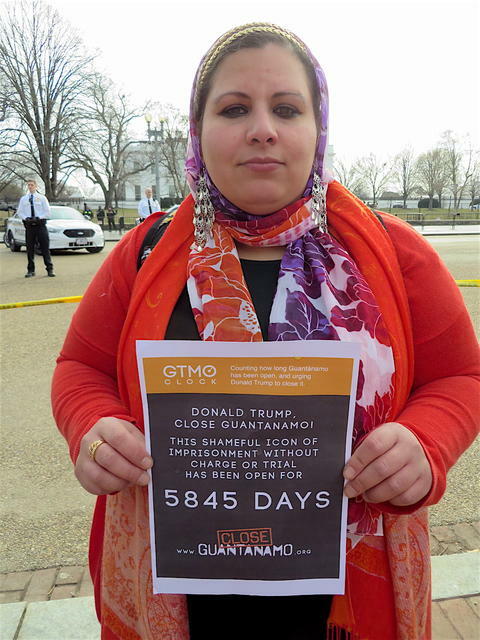 She was supporting the new Close Guantánamo initiative, counting how many days Guantánamo has been open — a shocking total of 5,845 days on the anniversary. Darakshan Raja, the co-director of the Justice For Muslims Collective, calls on Donald Trump to close Guantánamo at the annual rally outside the White House on January 11, 2018, the 16th anniversary of the opening of the prison. 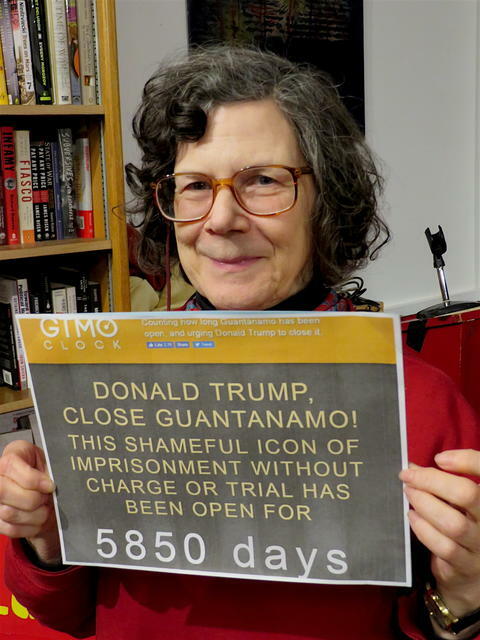 She was supporting the new Close Guantanamo initiative, counting how many days Guantanamo has been open — a shocking total of 5,845 days on the anniversary. 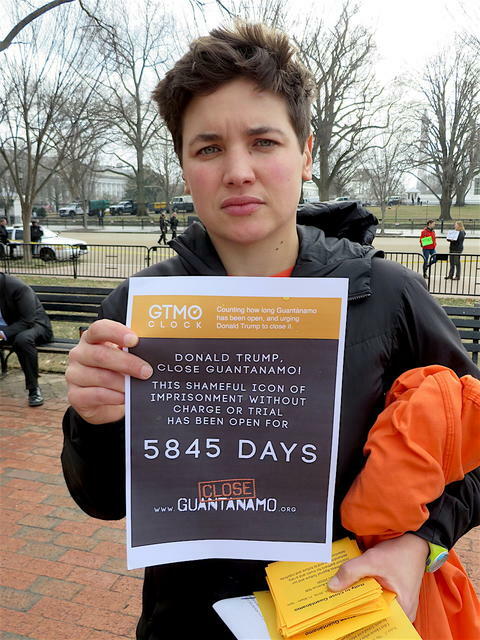 Social justice campaigner Nicole Fauster calls on Donald Trump to close Guantanamo at the annual rally outside the White House on January 11, 2018, the 16th anniversary of the opening of the prison. 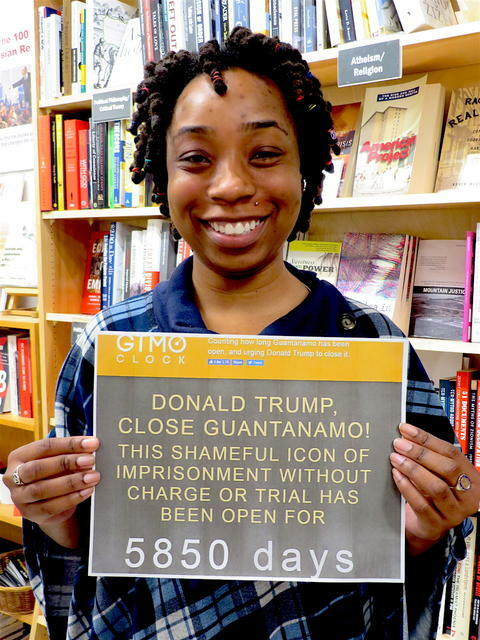 She was supporting the new Close Guantanamo initiative, counting how many days Guantanamo has been open — a shocking total of 5,845 days on the anniversary. 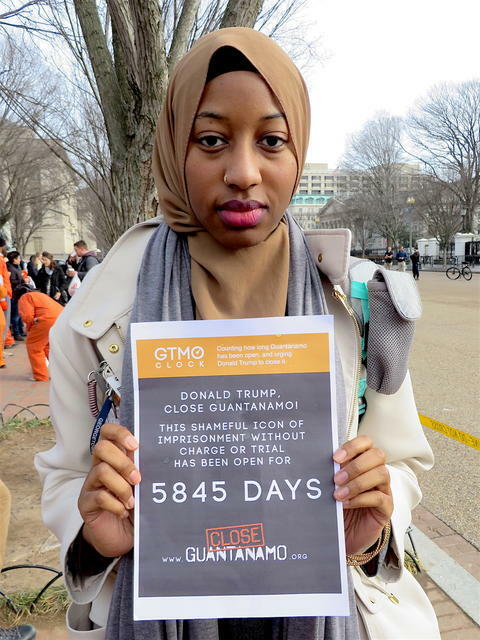 Campaigner Leah Brown calls on Donald Trump to close Guantanamo at the annual rally outside the White House on January 11, 2018, the 16th anniversary of the opening of the prison. 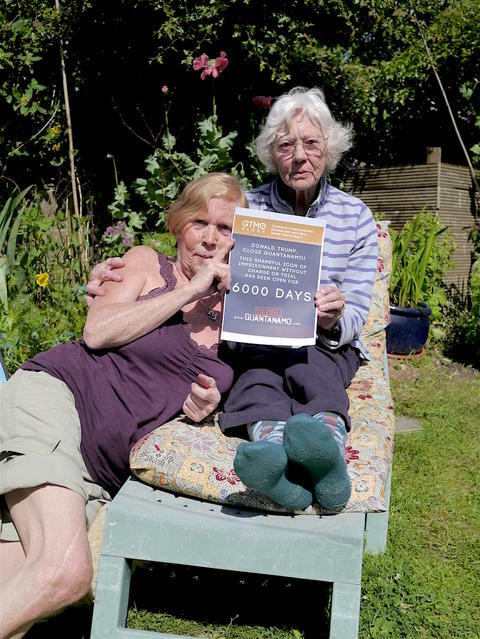 She was supporting the new Close Guantanamo initiative, counting how many days Guantanamo has been open — a shocking total of 5,845 days on the anniversary. 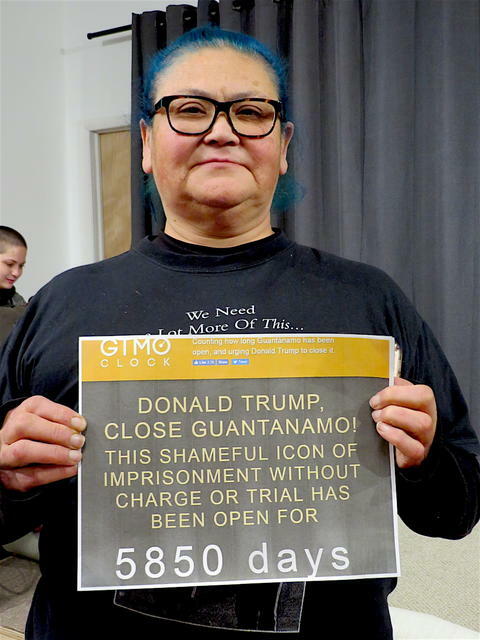 In Brussels, prison teacher and activist Luk Vervaet calls on Donald Trump to close Guantanamo as part of the new Close Guantanamo initiative, counting how many days Guantanamo has been open — a shocking total of 5,845 days on the anniversary. Political blogger The Talking Dog, holding a World Can’t Wait placard, calls on Donald Trump to close Guantánamo at the annual rally outside the White House on January 11, 2018, the 16th anniversary of the opening of the prison. 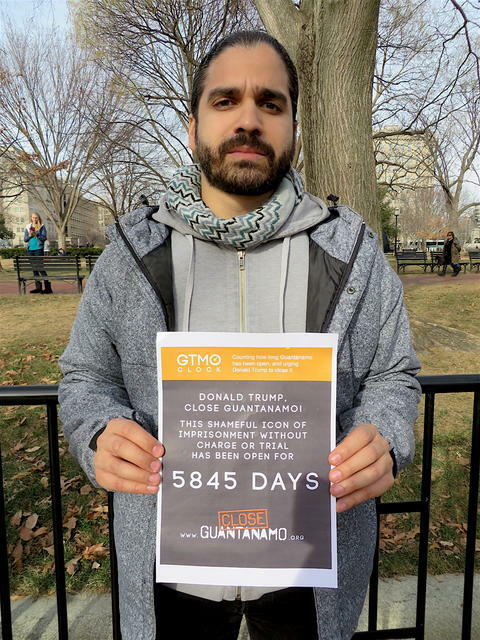 He was supporting the new Close Guantánamo initiative, counting how many days Guantánamo has been open — a shocking total of 5,845 days on the anniversary. 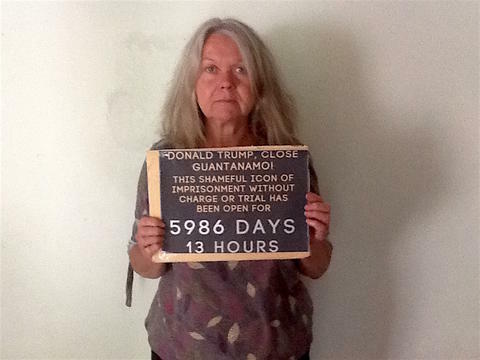 Joan Walsh, an anti-torture activist from North Carolina, with North Carolina Stop Torture Now, calls on Donald Trump to close Guantánamo at the annual rally outside the White House on January 11, 2018, the 16th anniversary of the opening of the prison. 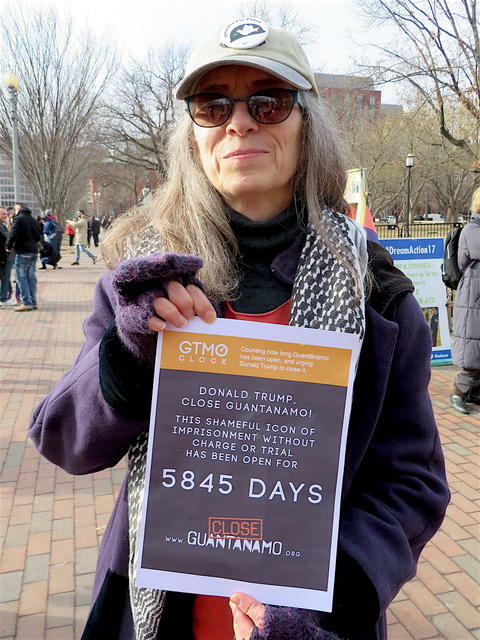 She was supporting the new Close Guantánamo initiative, counting how many days Guantánamo has been open — a shocking total of 5,845 days on the anniversary. 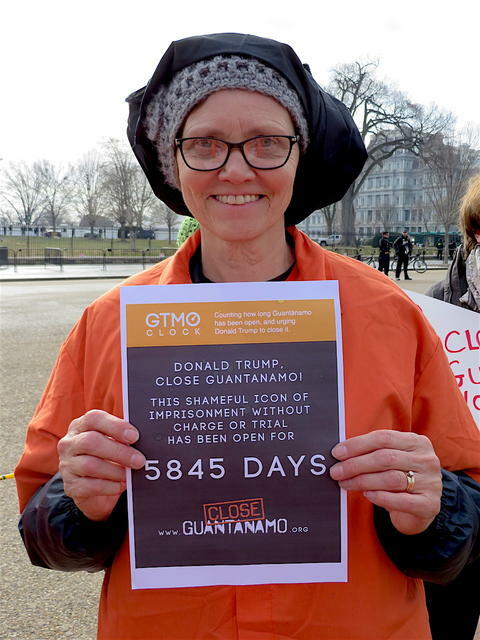 Close Guantánamo supporter Amy Phillips calls on Donald Trump to close Guantánamo at the annual rally outside the White House on January 11, 2018, the 16th anniversary of the opening of the prison. 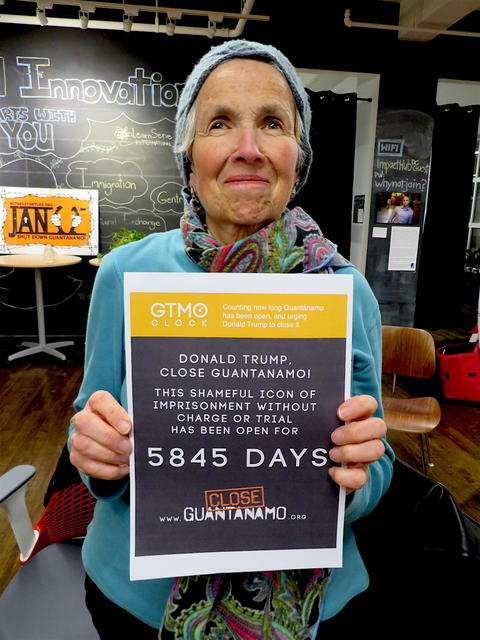 She was supporting the new Close Guantánamo initiative, counting how many days Guantánamo has been open — a shocking total of 5,845 days on the anniversary. 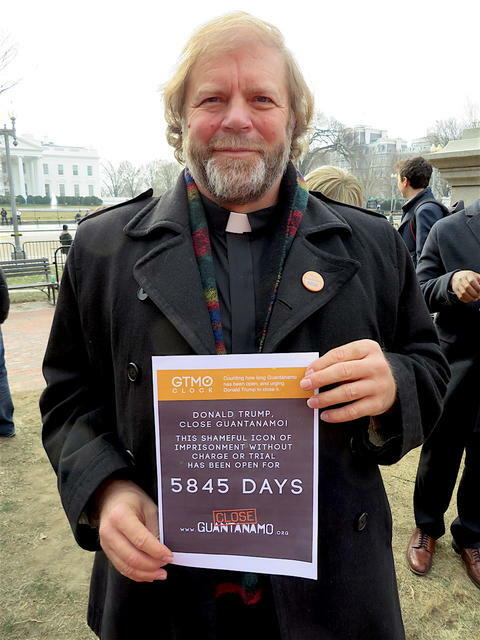 The Reverend Ron Stief, the Executive Director of the National Religious Campaign Against Torture (NRCAT), calls on Donald Trump to close Guantánamo at the annual rally outside the White House on January 11, 2018, the 16th anniversary of the opening of the prison. 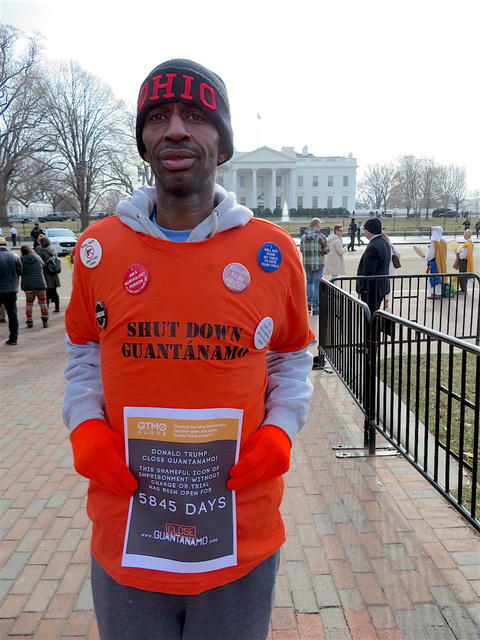 He was supporting the new Close Guantánamo initiative, counting how many days Guantánamo has been open — a shocking total of 5,845 days on the anniversary. Close Guantánamo co-founder Andy Worthington, Mitch Robinson, international law expert for Mustafa al-Hawsawi, one of five "high-value detainees" at Guantánamo accused of involvement in the 9/11 attacks, and Daphne Eviatar of Amnesty International USA call on Donald Trump to close Guantánamo at the annual rally outside the White House on January 11, 2018, the 16th anniversary of the opening of the prison. 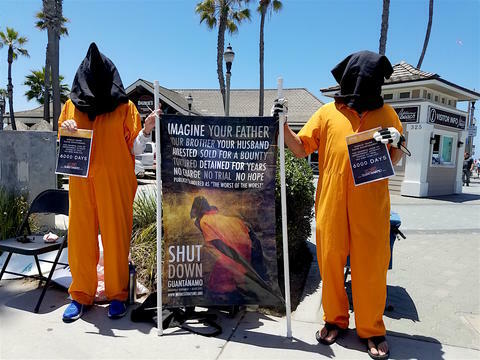 They were supporting the new Close Guantánamo initiative, counting how many days Guantánamo has been open — a shocking total of 5,845 days on the anniversary. Amnesty Internatonal USA is marking the anniversary by campaigning for the release of Tawfiq al-Bihani (aka Toffiq al-Bihani), a Yemeni who was approved for release in 2010, but is still held (one of five men still held, out of 41 in total, who were approved for release under President Obama). And here's Amnesty International USA's petition, to defense secretary James Mattis, calling for his release. 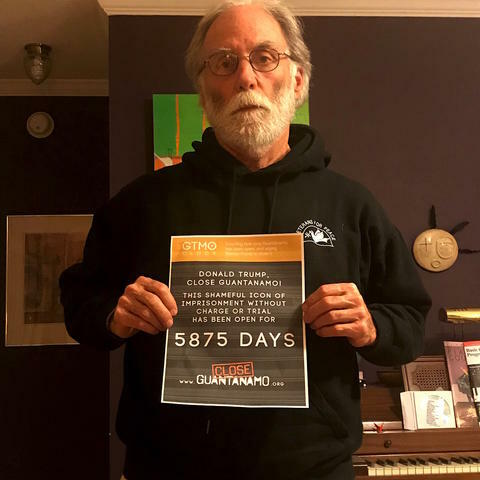 Steve Lane, in Bethesda, Maryland supports the new Close Guantánamo initiative, counting how many days Guantánamo has been open — a shocking total of 5,845 days on the 16th anniversary of its opening, on Jan. 11. Steve says, "If it is wrong to imprison a U.S. citizen without a speedy trial, why is it not wrong to imprison a non-citizen for 5,845 days without trial? Aren't the rights in the U.S. Constitution universal rights, to be enjoyed by everyone? Why does the U.S., once a shining beacon of hope around the world, violate its own principles, in a way that harms others and itself as well?" Chantal de Alcuaz of Witness Against Torture calls on Donald Trump to close Guantánamo at the annual rally outside the White House on January 11, 2018, the 16th anniversary of the opening of the prison. 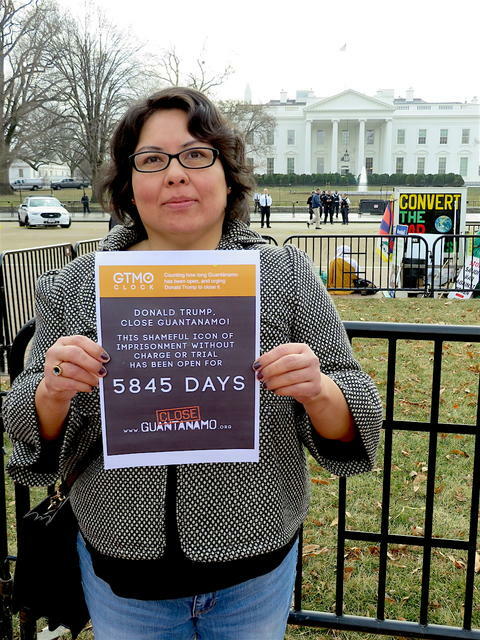 She was supporting the new Close Guantánamo initiative, counting how many days Guantánamo has been open — a shocking total of 5,845 days on the anniversary. 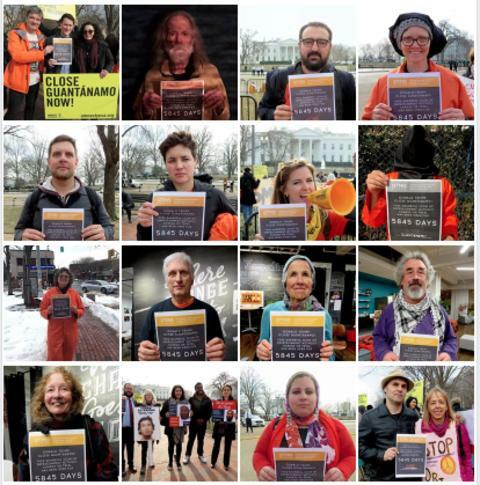 Founded in 2005, Witness Against Torture lead the struggle to close Guantánamo on and around the anniversary in Washington, D.C., holding a week of actions, and fasting throughout it. Their connection with each other, their empathy for the prisoners, and the depth of emotion they bring to the campaign is genuinely inspiring. 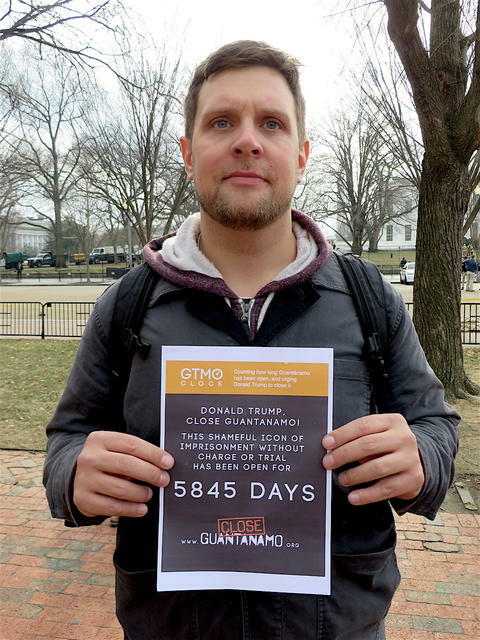 Chris Knestrick of Witness Against Torture calls on Donald Trump to close Guantánamo at the annual rally outside the White House on January 11, 2018, the 16th anniversary of the opening of the prison. 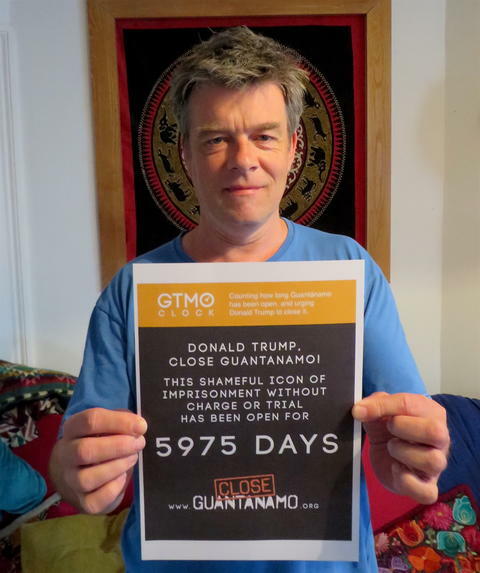 He was supporting the new Close Guantánamo initiative, counting how many days Guantánamo has been open — a shocking total of 5,845 days on the anniversary. Founded in 2005, Witness Against Torture lead the struggle to close Guantánamo on and around the anniversary in Washington, D.C., holding a week of actions, and fasting throughout it. Their connection with each other, their empathy for the prisoners, and the depth of emotion they bring to the campaign is genuinely inspiring. Josie Setzler of Witness Against Torture calls on Donald Trump to close Guantánamo at the annual rally outside the White House on January 11, 2018, the 16th anniversary of the opening of the prison. 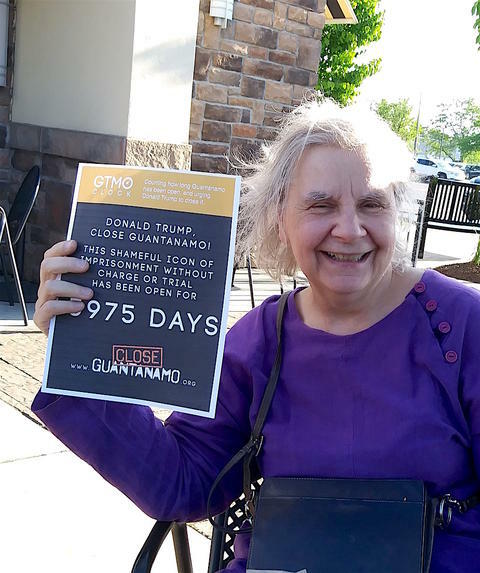 She was supporting the new Close Guantánamo initiative, counting how many days Guantánamo has been open — a shocking total of 5,845 days on the anniversary. Founded in 2005, Witness Against Torture lead the struggle to close Guantánamo on and around the anniversary in Washington, D.C., holding a week of actions, and fasting throughout it. Their connection with each other, their empathy for the prisoners, and the depth of emotion they bring to the campaign is genuinely inspiring. 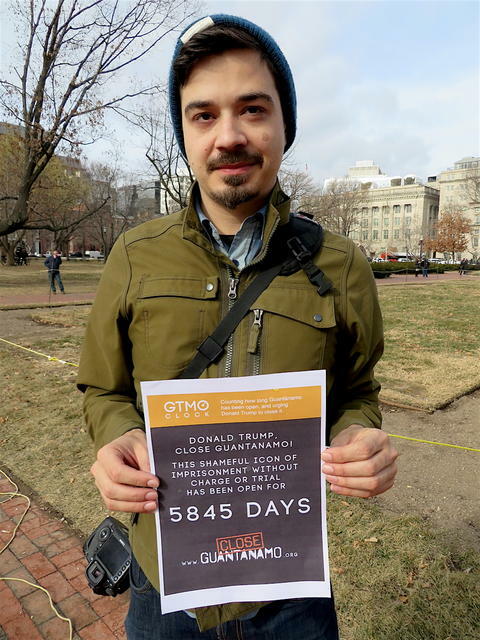 Matt Daloisio of Witness Against Torture calls on Donald Trump to close Guantánamo at the annual rally outside the White House on January 11, 2018, the 16th anniversary of the opening of the prison. 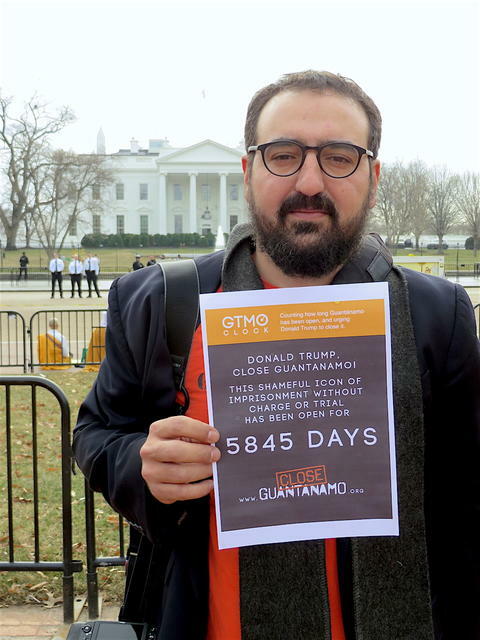 He was supporting the new Close Guantánamo initiative, counting how many days Guantánamo has been open — a shocking total of 5,845 days on the anniversary. Founded in 2005, Witness Against Torture lead the struggle to close Guantánamo on and around the anniversary in Washington, D.C., holding a week of actions, and fasting throughout it. Their connection with each other, their empathy for the prisoners, and the depth of emotion they bring to the campaign is genuinely inspiring. Alli McCracken of Amnesty International USA at the protest outside the White House on Jan. 11, the 16th anniversary of the opening of Guantánamo, showing her support for the new Close Guantánamo initiative, counting how many days Guantánamo has been open — shockingly, 5,845 in total on the anniversary. 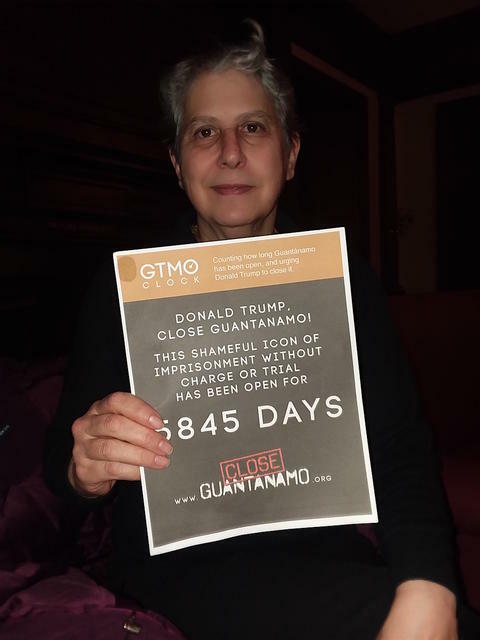 In Mexico City yesterday, Jan. 11, the 16th anniversary of the opening of Guantánamo, Natalia R. Scott showed her support for the new Close Guantánamo initiative, counting how many days Guantánamo has been open — shockingly, 5,845 in total on the anniversary. 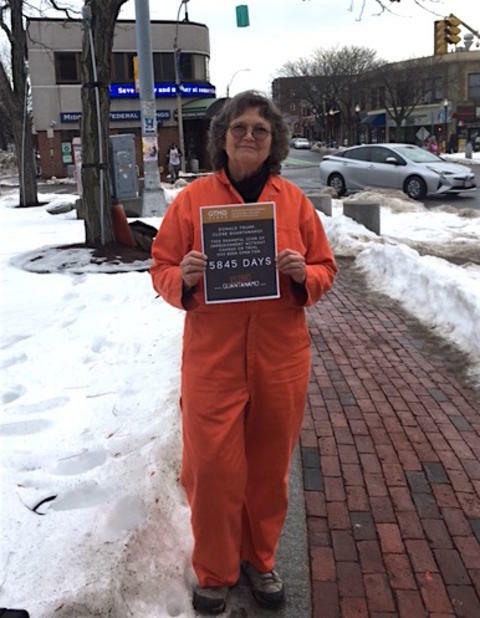 In Somerville, Massachusetts yesterday, Jan. 11, the 16th anniversary of the opening of Guantánamo, Susan McLucas showed her support for the new Close Guantánamo initiative, counting how many days Guantánamo has been open — shockingly, 5,845 in total on the anniversary. 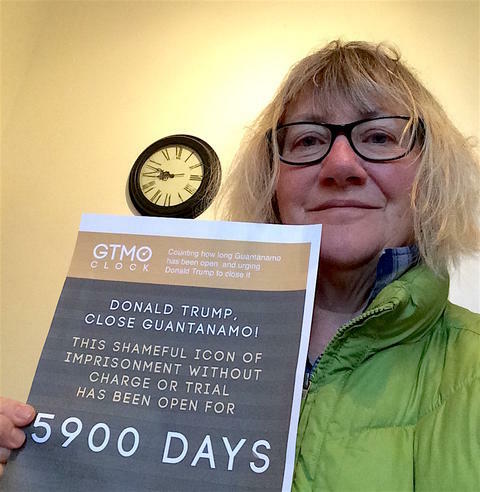 On the eve of the 16th anniversary of the opening of the prison at Guantánamo Bay, on Jan. 11, 2018, activists held an event in Washington, D.C., "There is a Man Under that Hood: Closing Guantánamo and Ending Torture in the Age of Trump," at which peace activist Kathy Kelly (Voices for Creative Nonviolence) supported the new Close Guantánamo initiative, counting how many days Guantánamo has been open — a shocking total of 5,845 days on the anniversary. On the eve of the 16th anniversary of the opening of the prison at Guantánamo Bay, on Jan. 11, 2018, activists held an event in Washington, D.C., "There is a Man Under that Hood: Closing Guantánamo and Ending Torture in the Age of Trump," at which peace activist Brian Terrell (Voices for Creative Nonviolence) supported the new Close Guantánamo initiative, counting how many days Guantánamo has been open — a shocking total of 5,845 days on the anniversary. On the eve of the 16th anniversary of the opening of the prison at Guantánamo Bay, on Jan. 11, 2018, activists held an event in Washington, D.C., "There is a Man Under that Hood: Closing Guantánamo and Ending Torture in the Age of Trump," at which Beth Adams of Witness Against Torture supported the new Close Guantánamo initiative, counting how many days Guantánamo has been open — a shocking total of 5,845 days on the anniversary. On the eve of the 16th anniversary of the opening of the prison at Guantánamo Bay, on Jan. 11, 2018, activists held an event in Washington, D.C., "There is a Man Under that Hood: Closing Guantánamo and Ending Torture in the Age of Trump," at which Martin Gugino of Witness Against Torture supported the new Close Guantánamo initiative, counting how many days Guantánamo has been open — a shocking total of 5,845 days on the anniversary. 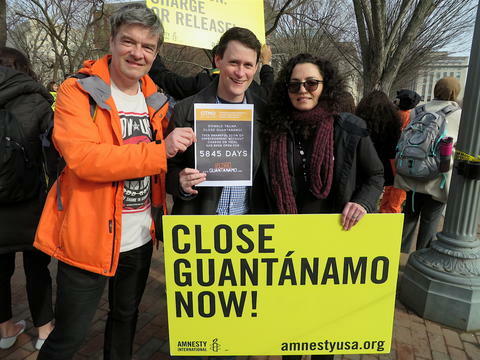 At the annual rally outside the White House on January 11, 2018, the 16th anniversary of the opening of the prison, representatives of the Center for Constitutional Rights were supporting the new Close Guantánamo initiative, counting how many days Guantánamo has been open — a shocking total of 5,845 days on the anniversary. Legal Director Baher Azmy was holding the poster, on the left, with, from the center, Aliya Hussain, advocacy program manager, and attorneys Omar Farah and Pardiss Kebriaei. CCR were highlighting the cases of three of their clients, and had also just come from the National Press Club, where, with Reprieve and other lawyers, they had "filed a major challenge to Donald Trump’s continued detention of prisoners at Guantánamo," arguing, on behalf of 11 men still held, that "Trump's proclamation against releasing anyone from Guantánamo, regardless of their circumstances, which has borne out for the first full year of the Trump presidency, is arbitrary and unlawful and amounts to 'perpetual detention for detention’s sake.'" 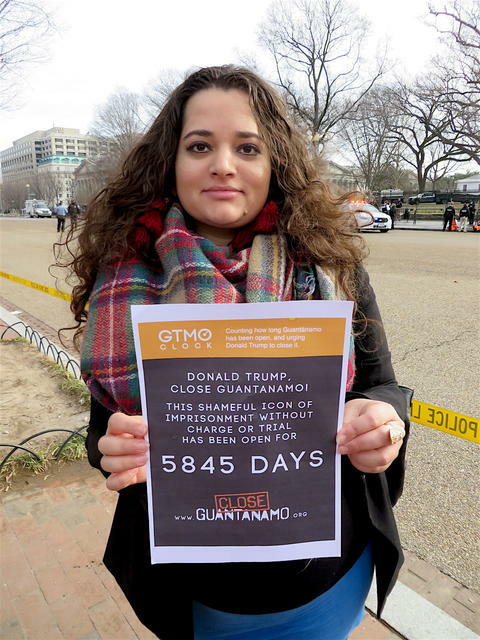 Maha Hilal, co-director of the Justice for Muslims Collective, calls on Donald Trump to close Guantánamo at the annual rally outside the White House on January 11, 2018, the 16th anniversary of the opening of the prison. For the anniversary, Maha said, "The existence of Guantánamo Bay prison epitomizes what institutional and structural Islamophobia looks like in practice. For sixteen years, the prison has been allowed to operate on false legal pretenses and no accountability whatsoever. This has not only damaged the lives of prisoners who have been released, but also means that those who remain behind the prison’s walls have little to no hope of justice. As one of the most glaring spectacles of how the War on Terror has targeted Muslims, Guantánamo Bay prison must be closed and torture ended to restore some semblance of justice — not selective or differential justice, but justice in its totality." 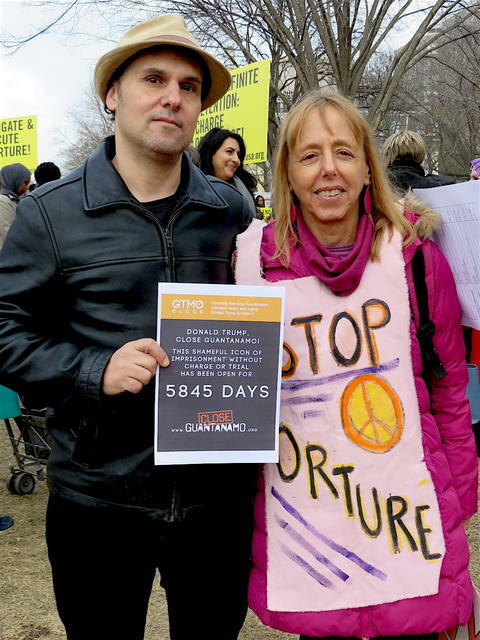 Jeremy Varon of Witness Against Torture and Medea Benjamin of CODEPINK: Women for Peace call on Donald Trump to close Guantánamo at the annual rally outside the White House on January 11, 2018, the 16th anniversary of the opening of the prison. 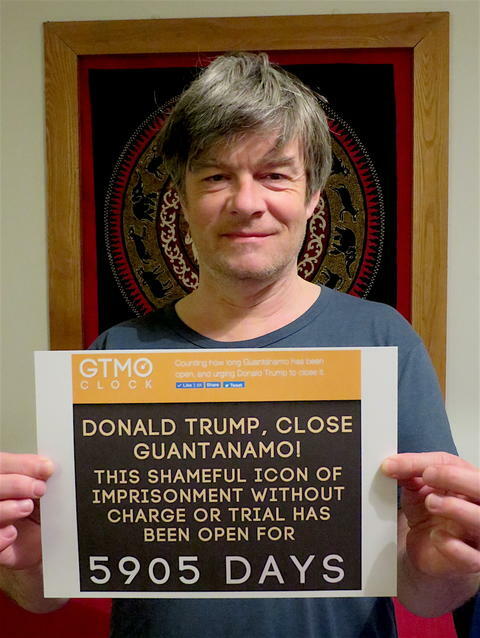 Close Guantánamo co-founder Andy Worthington launches the new initiative for January 11, 2018, urging Donald Trump to finally close Guantánamo, and to remove this long-standing stain on America's reputation as a country founded on the rule of law, and which respects the rule of law.